Not far from Mumbai’s CST railway terminus, traders selling woollen garments did brisk business. They have a temperamental December to thank. According to newspapers, on December 23, 2015, Mumbai recorded its second lowest temperature since December 1949; 11.6 degrees Celsius. The faint chill saw residents bring out their shawls and jackets. “ Early mornings and evenings in Mumbai are now pleasant to run,’’ Skalzang Lhundup said. We were in a nearby apartment, where a team of young runners from Ladakh, in the city to train and get ready for the 2016 Standard Chartered Mumbai Marathon (SCMM), stayed. Skalzang was their manager. The whole team comprised seven civilian runners and 11 personnel of the Indian Army’s Ladakh Scouts regiment. The army runners were camped in Pune, where the military has its facilities, including training facilities for athletes. They were expected in Mumbai by early January. On December 6th, when the civilian component of the team left Leh for Delhi en route to the marathons of the plains, Ladakh’s winter temperature was already sub-zero, nudging minus ten at its lows. Peak winter was yet to come. Following the September 2015 edition of the annual Ladakh Marathon, the civilians in the team – the 18 member contingent includes category toppers from the Ladakh Marathon and the Khardung La Challenge ultra marathon held alongside it – hadn’t had much time to train for SCMM or any other events in the plains. Two things intervened. First, winter break was approaching with school exams ahead of that. Some of the young runners still tackling their twelfth standard can’t overlook exams. Second, as winter took hold, training outdoors became a challenge. While the army runners have their own training regimen, from among the civilians, only the very determined may have managed to squeeze in a few practice runs outdoors, Skalzang said. Every year since the 2013 Ladakh Marathon, its organizer Rimo Expeditions, has brought the winners of each edition to Mumbai to attempt the SCMM. The Mumbai marathon is India’s biggest and the richest in terms of prize money. On the previous two occasions, the team stayed at Bandra in suburban Mumbai. “ Our current location near CST is more practical,’’ Skalzang said. Early morning, the team walks to Nariman Point in South Mumbai, where the NCPA end of Marine Drive’s promenade is a popular assembling point for runners. In Mumbai the Ladakh team trains with Savio D’Souza, who is among the city’s well known coaches. He was in Leh earlier this year to train promising local runners ahead of the last Ladakh Marathon. Typically Ladakh’s team of runners travels to Mumbai, participates in the SCMM and returns to Ladakh. The 2015 trip is the first time the team has travelled out from Ladakh for what may hopefully be a brief season of running a few marathons in the plains; not just SCMM. If all goes well, they plan to be running in the plains, warm compared to Ladakh, till end-February, Skalzang said. The team has already finished competing at its first event of the season. On December 6th, the group had flown from Leh to Delhi and proceeded immediately by train to Mumbai and then onward to Goa for the annual Goa River Marathon (GRM). 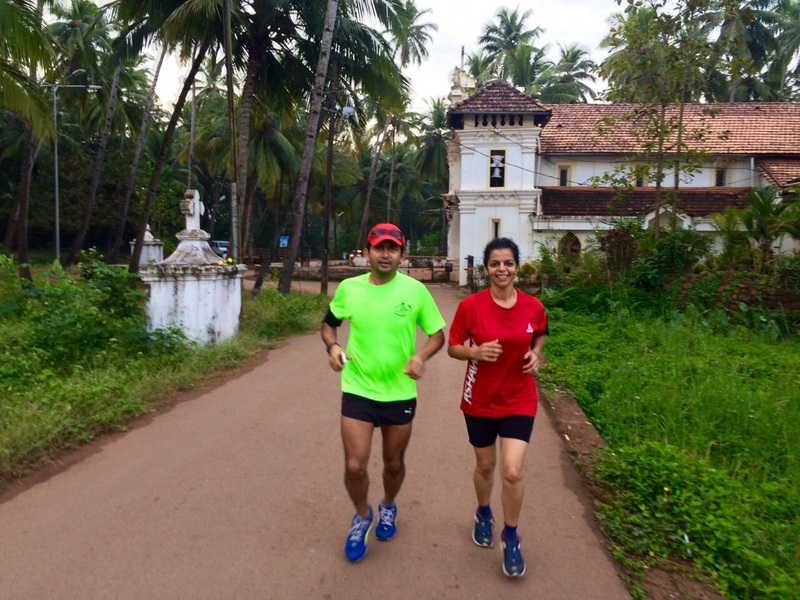 Arriving from high altitude to a sea level-location with not much training done to boot, they spent a couple of days running on Goa’s beaches. The heat and humidity of a December by the sea, was tough to cope with. “ Especially the humidity,’’ Skalzang said. On December 13, four days after they reached Goa, the race took place. The Ladakhi runners ended up with six podium finishes. The podium finishers in their respective categories were Jigmet Dolma (women full marathon / open / age: 18 plus, second, 3:59:02), Tsetan Dolkar (women full marathon / open / age: 18 plus, third, 4:05:42), Sonam Chuskit (women full marathon / Indian participant category / age: 18 plus, first, 5:01:10), Stanzin Norbu (men full marathon / Indian participant category / age: 18 plus, second, 3:12:20 ), Tsering Dolkar (women half marathon / Indian participant category / age: 18 plus, second, 1:52:15) and Diskit Dolma (women half marathon / Indian participant category / age: 18 plus, third, 1:52:17). Stanzin Norbu is from Ladakh Scouts. Skalzang said the youngsters in the team had instructions not to ignore their studies; a couple of them had exams to give on return to Leh. Amid training for the SCMM, the morning and evening practice runs and managing their temporary accommodation in the apartment (it is self supported life; the youngsters cook their food themselves), they find time for studies. They hailed from villages, near and far from Leh; villages like Igoo, Lamayuru, Saspol, Nether in Changthang, Lingshed, Pishu in Zanskar and Tamachik. A bigger event with many more participants, the competition at SCMM will be tougher than at GRM. Both Jigmet Dolma and Tsetan Dolkar said that they have slowly got used to Mumbai’s weather. According to Skalzang, Savio is exploring other events the runners can be at after SCMM, before they return home to Ladakh. Samar Farooqui was the last speaker at a recent conclave of experiential educators on the outskirts of Mumbai. He had a Power Point presentation. 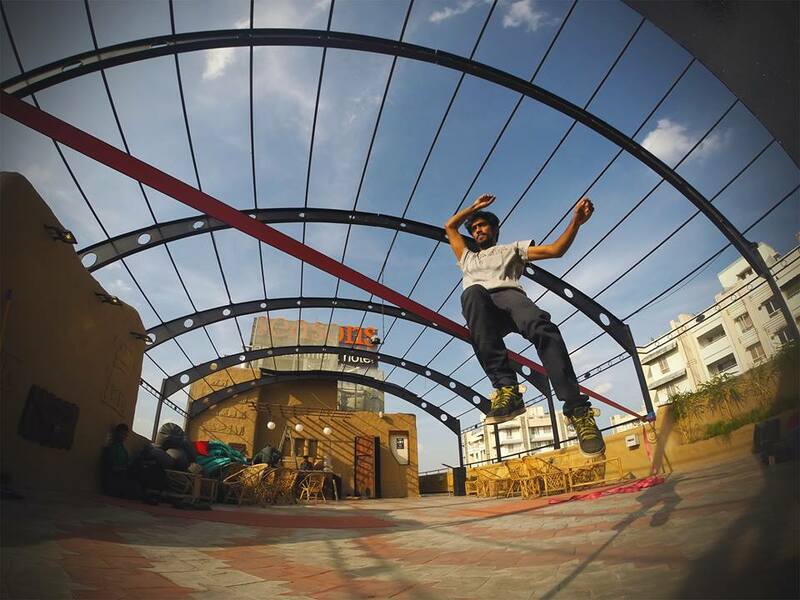 That soon slid to forgotten backdrop as Samar’s demeanour, moulded by slackline, took over. Like the line – at times still, at times swaying and bouncing to provide momentum for a gymnastic trick – his talk was honest and focused, yet delightfully spontaneous. Samar’s talk was capped at conclave’s end by a demonstration of his craft. A day after the conclave, I called him up for an appointment to meet. It was a chat on the move, beginning at Stadium Restaurant in Mumbai’s Churchgate and concluding on a segment of Marine Drive marked by two trees with a story to tell. Born 1990 in Mumbai and brought up in the city, Samar grew up with affinity for sports and the outdoors. Staying at Haji Ali, as a child he used to go for morning jogs at the nearby Race Course. By the time he was in the sixth standard, he became the youngest participant in a 3000m race that year at his school. He was also active in cricket and football. His mother, a teacher who was active in the National Cadet Corps (NCC), introduced him to outdoor camps. When he was in the eleventh grade, Samar got to work at a camp run by a city-based outdoor company. “ It was the first time I got paid for such work. It wasn’t something I expected. It just happened. But it made me think, going ahead why not this for livelihood?’’ Samar said. He kept working for the company – Outbound Adventures, managed by Andre Morris. Through Andre, he met Jehan Driver and worked for Jehan’s company, Quest Adventures. Somewhere in the middle of all this, he finished his twelfth and joined college to graduate in mass media (BMM). He did not come across as very attached to classrooms and college; it wasn’t uncommon for Samar to bunk classes and take off on a hike or climb. At Quest Adventures, Samar’s responsibilities included guiding inbound tourists on their exploration of India. In February 2010, his clients were two ladies from New Zealand. Ahead of this trip and as part of preparations, Jehan and Samar visited AVI Industries, the shop retailing outdoor gear in Matunga. There they were shown a slackline. Not knowing the sport at all, they still bought it for the core idea appeared very simple – a length of suitably designed webbing (unlike a rope, webbing is flat), which can be appropriately tightened and tuned to required tension between two points, usually two trees. Critically, the webbing used is dynamic, in other words – it stretches like an elastic band, providing the person on top the ability to generate adequate momentum for performing tricks. Once installed, you balance on the slackline, walk on it as in a tight rope act; you also do tricks on it as you get better. For safety, depending on the height and what he is doing, the slackliner stays attached to the line with a leash, one end of which is tied into his harness. If he falls at height, he does not get detached from the line. At Kashid beach, about 130 km from Mumbai, Samar, Jehan and the clients from New Zealand tried out the line. Samar was hooked. But it would be sometime before he devoted himself to the sport. Although he had enrolled to study media management in college, a new idea gnawed at Samar. Internet searches for alternatives in education had introduced him to adventure tourism studies in New Zealand. It was tough convincing his parents, who were justifiably concerned of Samar’s atypical choices. A close cousin worked on them; they soon came around. Funds were a problem but his family helped. In July 2010, he reached Queenstown in New Zealand’s South Island via Auckland. The flight from Mumbai transplanted Samar within hours from South Asia’s monsoon humidity to South Island’s cold. It was his first trip overseas. He presented himself at Queenstown Resort College for the 18 month-diploma course. NZone Skydiving, one of the biggest operators in skydiving in New Zealand, had its office in Queenstown. Samar was enamoured by sky diving. Although the first six months at the college were devoted to theory, he started visiting NZone and connecting with them. “ I was ready to do anything to be around skydiving,’’ Samar said. In the second tranche of six months, his college directed him to a bungee jumping facility for internship. But he was set on skydiving and luckily, his passion and persistence from the preceding six months paid off – he secured an internship at NZone. But he had to settle for a compromise. The drop zone is where all skydiving action is. Samar secured the interview for work at the drop zone without his college involved in the frame. Result – he was placed on the shop floor, not at the drop zone he yearned to be at. Still, Samar benefited from the experience. One thing he learnt was the Kiwi style of presenting adventure to clients; you don’t conceal danger, you state it. “ That way the customer learns to be at peace with reality,’’ Samar said. The last six months of his course were spent in reviews back in the classroom. Two days after he gave his exams, Samar was hired as Site Operations Manager by Magic Memories. He was located at Agrodome in Rotorua, North Island, which offered visitors an experience of farming in New Zealand. His job revolved around photos that tourists could take back with them. The job also saw him posted at the Waitomo Glowworm Caves, roughly 140km from Rotorua. He used his time on North Island to further his interest in skydiving. 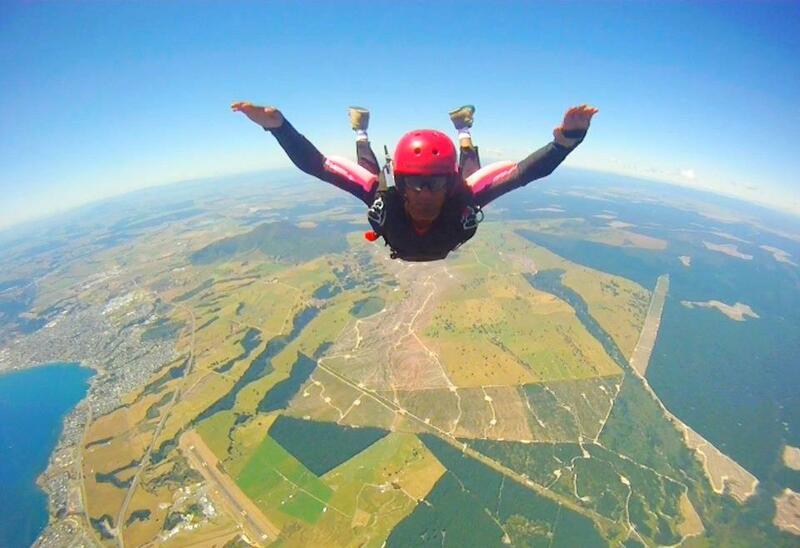 He dived with Taupo Tandem Skydiving, located about 82km from Rotorua and 150km from Waitomo. “ Different skydiving schools have different training methods. The deal at Taupo was that after 25 jumps you got an ` A’ licence. The first jump is a tandem jump, the ones thereafter are solo. I did about eight jumps, so I didn’t get a licence,’’ Samar said. After Waitomo, his next major stop with Magic Memories was Milford Sound in South Island, about 290km away from Queenstown. But before Milford Sound, Samar paid a short visit to India; on this trip, he did some groundwork for popularizing slacklining. Milford Sound was an opportunity to reconnect with rock climbing. While studying in Queenstown, Samar’s close friends had been college mates Anton Westberg and Gustav Holmquist and a friend he met through them, Banjamin Lagermalm – all from Sweden, all rock climbers. It wasn’t uncommon for the quartet to bunk college and steal off on climbs. When Samar moved to Milford Sound, Anton and Gustav were also there working. In their company, Samar did his first multi-pitch rock climbs at Milford Sound. His stint with Magic Memories paid well. “ I did really well at this job, right after college this was good bragging rights,’’ Samar said. The money was useful; that’s how he had funded his skydives on North Island. The downside of his photography-job was that over time it became routine. “ I enjoyed sales and the idea of selling ice to Eskimos. But after a point in time I felt burnt out and tired of the paradigm,’’ Samar said. He didn’t feel good about that. The hope was – somehow this would all lead to more skydiving and hopefully, a job therein. Sadly that proved tough. Following his stint with Magic Memories, Samar returned to Queenstown. He approached NZone and other skydiving companies. But it was the off season, job openings were limited. He was not only seeking work in skydiving, he wanted to be at the drop zone. That was a tall order. According to Samar, his final phase at Magic Memories and the futile search for vacancies in skydiving soon thereafter, was a trying period. Pleasant distraction was his constant companion – his slacklining kit. His skills on the line fetched positive comments. 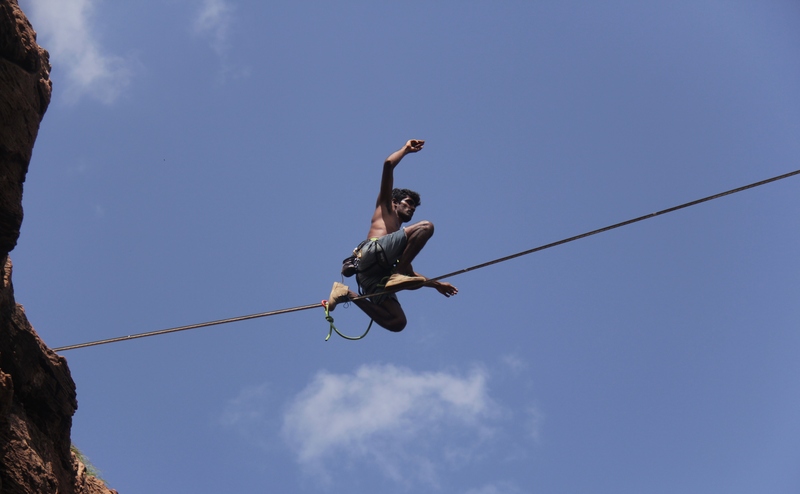 To recap, after that taste of slacklining on Kashid beach, Samar had continued practising. Slowly his skills developed. When he arrived in Queenstown for studies, the season was drifting toward winter; not the ideal time for slacklining outdoors. In the summer of 2011, he ran into some people slacklining on the beach. They became another community to hang out with, besides the rock climber friends from college. Free time, stolen time – it went into these pursuits. By the time he hit that post Magic Memories phase, he was a decent slackliner. To keep himself afloat, he worked at a call centre, did construction work and even worked as a bouncer. 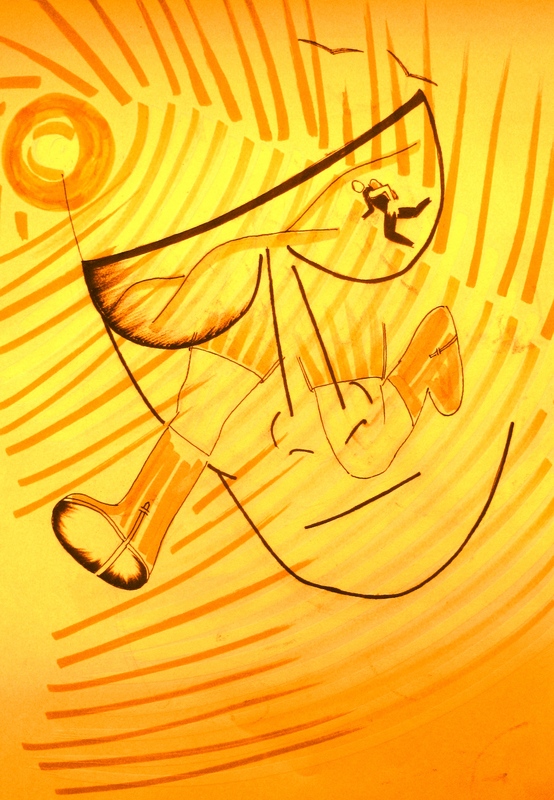 Samar calls this phase one of “ self discovery.’’ It was also a stage when he had more time on his hands. Samar started pursuing an intense slacklining routine. “ My favourite thing to do still is – plug in some music and go slacklining. I enjoy it, it channelizes my excess energy,’’ he said. Further, off late the airiness of the slackline has become a fine intermediate to two activities that fascinate Samar – skydiving and base jumping. Queenstown was generally supportive of the small slacklining community Samar belonged to. As people realized that these youngsters were focused on growing their skills and lived a life around it, a social niche evolved. 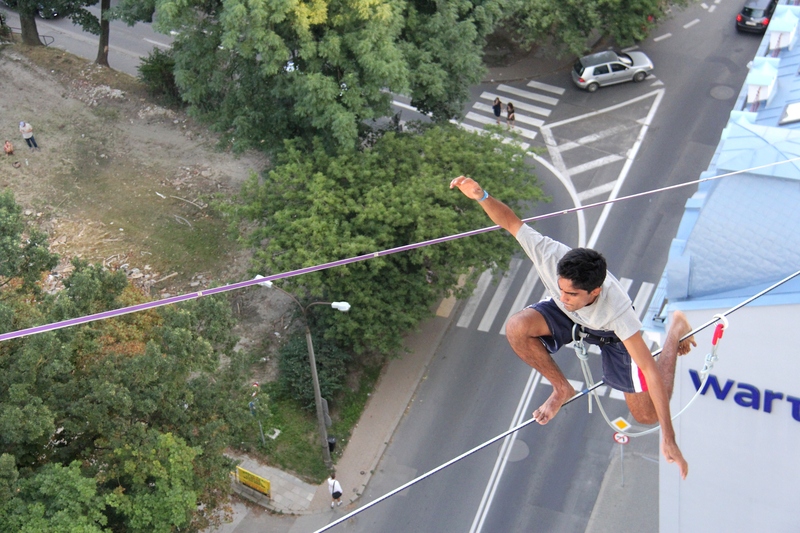 Samar and his friends began organizing meet ups for slackliners from elsewhere in New Zealand. At Samar’s initiative, the team set up slacklining for the American Express Queenstown Festival; they were covered on TV, they slacklined to collect funds for charity – a set of possibilities suddenly showed up. Then Samar got injured; a bad ankle-twist acquired while attempting a back-flip and trying to put a cap on at the same time. He was out of the sport for four weeks. It was May 2013. He decided he should head back to India and take his chances in life; grow awareness about slacklining and somehow figure out a way to earn a living from it. In July, he returned to Mumbai. Mumbai’s Marine Drive, right next to the Arabian Sea, has always been a popular spot for people to catch the sea breeze, relax, cosy up, walk, jog, maybe just sit and wonder what one is doing in Mumbai, where one is in life. Samar liked to slackline at Marine Drive. On the promenade, opposite the small junction where the road from Wankhede Stadium meets the main road, are two trees. As was his routine, Samar set up a slackline between these two trees and commenced practising. While he was on the line he heard a noise across the road; something like a collision. Noticing that two motorcyclists had hit each other, he got off the line and went to help. It was a minor collision, the bikers said they were alright and went their separate ways. But as Samar was getting back to his slackline on the promenade, a policeman accosted him and said he was the source of what went wrong. Had slackliner not been there for distraction, the bikers wouldn’t have hit each other. Taken aback by the argument, Samar pointed out that although he had nothing to do with what happened across the road he had got off the line and offered assistance to the bikers. The policeman asked if Samar had taken permission to put up the slackline; the trees, he highlighted, were public property owned by the municipal corporation. Samar had no such permission. He had assumed that the simple sport he was pursuing was simple enough for others to accept it in an equally simple fashion. The regulars of Marine Drive, used to seeing Samar on his slackline, supported him in the argument. But the argument was fast devolving into a clash of perspectives. The slackline was removed. Samar was arrested and taken to the local police station. The cops busied themselves framing appropriate charges. At the same time, some policemen who had seen him slacklining before on the promenade complemented him on his skills. Eventually, when the matter moved to Court, Samar discovered that the charges against him included obstructing pedestrian movement and blocking sunlight. He was let off with a fine. By then however, Samar’s predicament had reached the media. The incident was reported and Mumbai slacklining, riding Samar’s arrest for blocking sunlight, found itself in the spotlight. Soon, Samar was back on Marine Drive, slacklining. The police, he said, have a better understanding of his craft now. They realize that he means nobody any harm; they let him be. There is however a sting in the tail he needs to be wary of. He was let off with a fine and the condition that the fine would double if he repeated the offense. 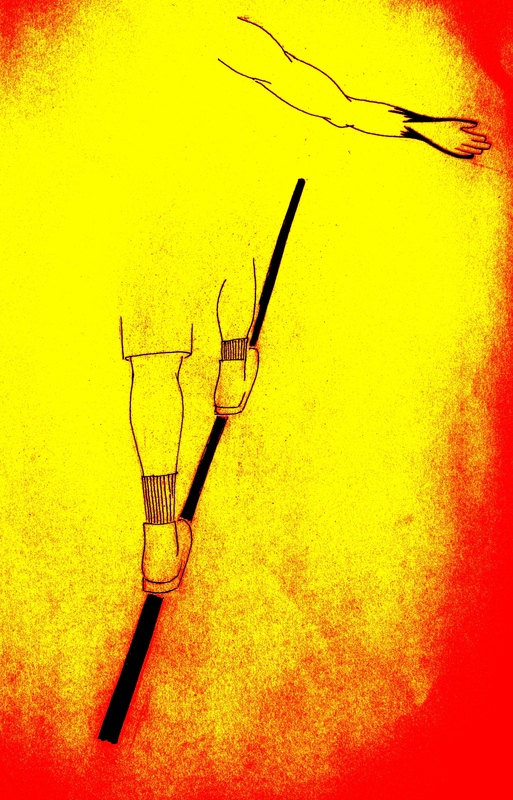 Do you give up slacklining or stop popularizing it because of that? Samar has decided to take his chances. Pooja Mehra is a forty year old mother of two children who runs a cafe – the Cafe Bella Vita at Celebration Sports Club in Andheri. She has a background in sports; she played badminton for many years and is a trekker and distance runner. Two years ago she was running on Marine Drive when she came across Samar and his slackline. After seeing him on the line, she asked if she could try it. The experience hooked her curiosity. She looked up the Internet for more information on slacklining. Homework done, she called up Samar and asked if he would teach her to slackline. Since there was much distance between where they stayed, they set about looking for a place to set up a line at a mutually convenient location. Eventually they found a good spot on a footpath in Juhu. Pooja’s first lessons in slacklining happened there. Then they shifted to a spot on Juhu beach, adequately away from the eyes of crowds (that can cast pressure on someone learning something new). Pooja learnt to walk the line, turn on it and sit on it. “ I fell many times. But you pick yourself up and work hard to improve. It is not an easy sport,’’ she said. Overall, she took about 15 classes from Samar. 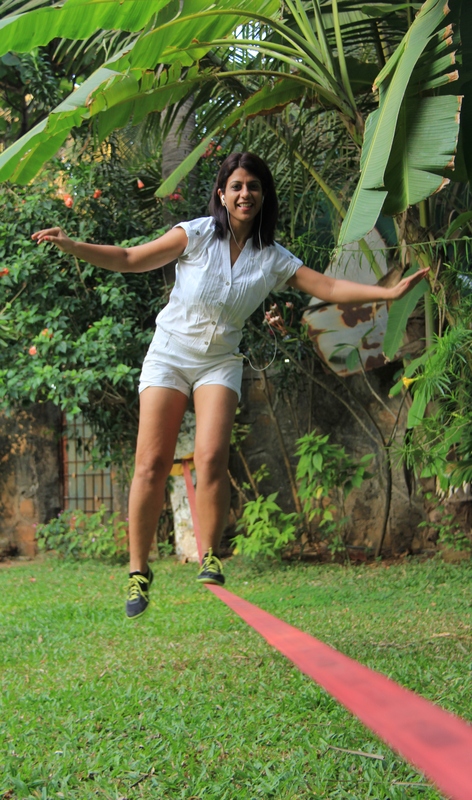 Then with Samar’s help, she acquired a slacklining kit so that she can keep practising. 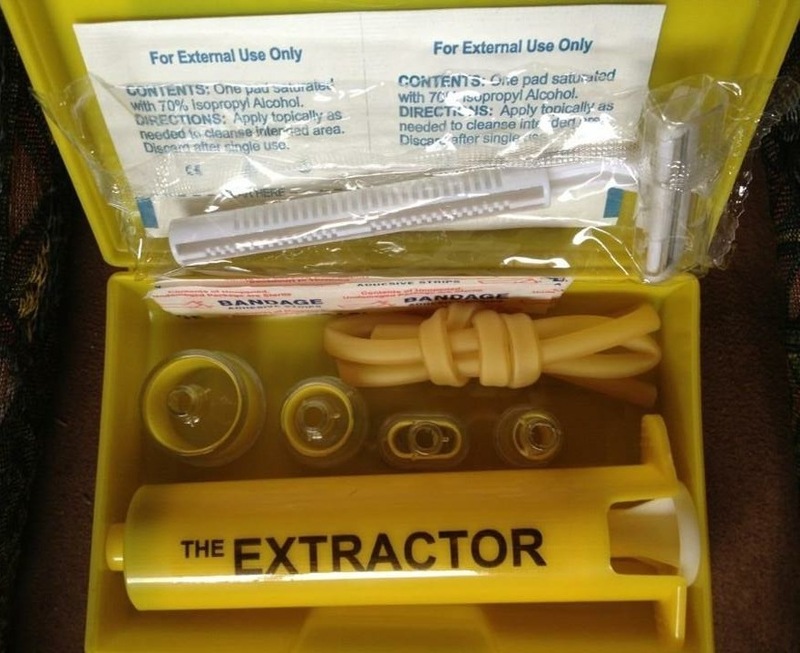 The kit is portable; you can carry it around, take it wherever you go. But finding a place with good anchor spots for the webbing and enough safety should you fall is tough in Mumbai. Adding to the problem is low awareness of the sport. On the other hand, there are many places away from the city which are good for slacklining. Pooja carries the kit with her on family holidays. She sets up the line. Her children have tried slacklining and she said it is a nice way for the family to bond. 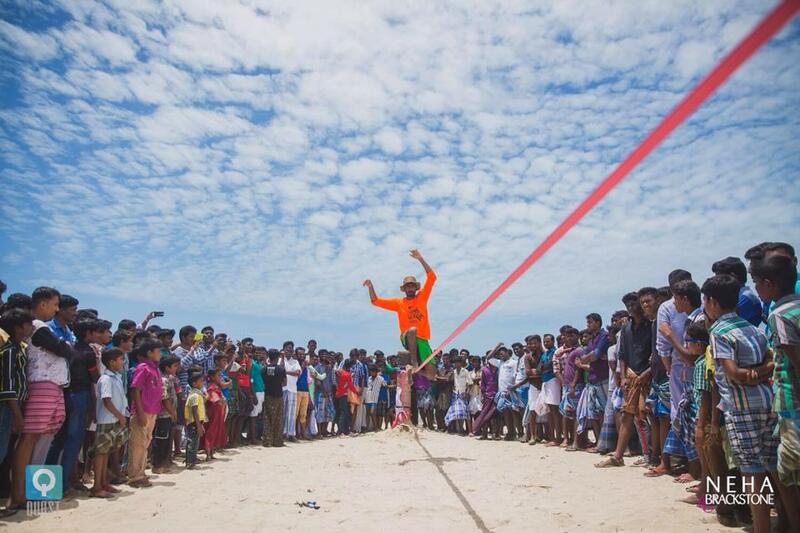 In July 2013, when Samar returned to India, there was a small slacklining community already existing in the country. The main two points for the faithful to gather were Slacktivism in Delhi and Slack.in, which hosted members from Bengaluru (Bangalore) and Pune. The whole community at that time must have been around 300 people-strong in India, of which about 10 per cent, Samar estimates, would have been active slackliners. Samar started Slacklife India in Mumbai. From a Facebook page it has since evolved into a company called Slacklife Inc. Along with that Samar has become a professional slackliner, someone whose income comes from practising and promoting the sport. Samar has appeared on Indian television, in such programmes as ` India’s Got Talent,’ ` I Can Do That’ and ` MTV HE Ticket.’ It helped promote the sport. Wikipedia’s page on slacklining mentions the sport’s many styles or categories. For now, the styles relevant to India include the basic slack lining format; trick lining, mid lining and high lining. Trick lining involves the execution of tricks on a line while mid lining and high lining involve slack lining at various heights with room for tricks there too. Mid lining and high lining, because they need height, may be set up across buildings, structures, rock faces etc. As the sport grows, new lines are being set up. These are essentially places where a good line can be; a physical line materializes only when you actually put one up for your use. You have to have an eye for a possible line to put one up. Some of the high lines around Mumbai-Pune-Nashik are a line across a quarry in Pune (it was pioneered in September 2014 and that first line was called Jugad Line because it was improvised [jugad means: makeshift] for want of adequately long webbing and therefore sketchy. Samar emphasizes that such joined lines should be avoided), Mid Line Crisis in Taminighat and Life and Exposure in Nashik. One of Samar’s highpoints since returning to Mumbai was participating at the Urban Highline Festival in Lublin, Poland. 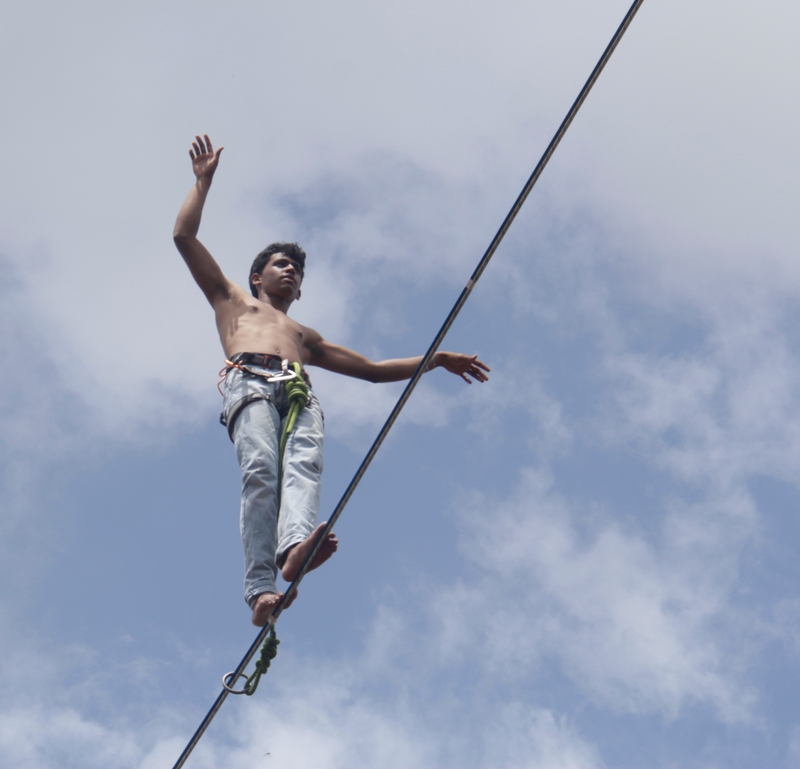 At this event, he was the only slackliner the organizers had ever seen from India. 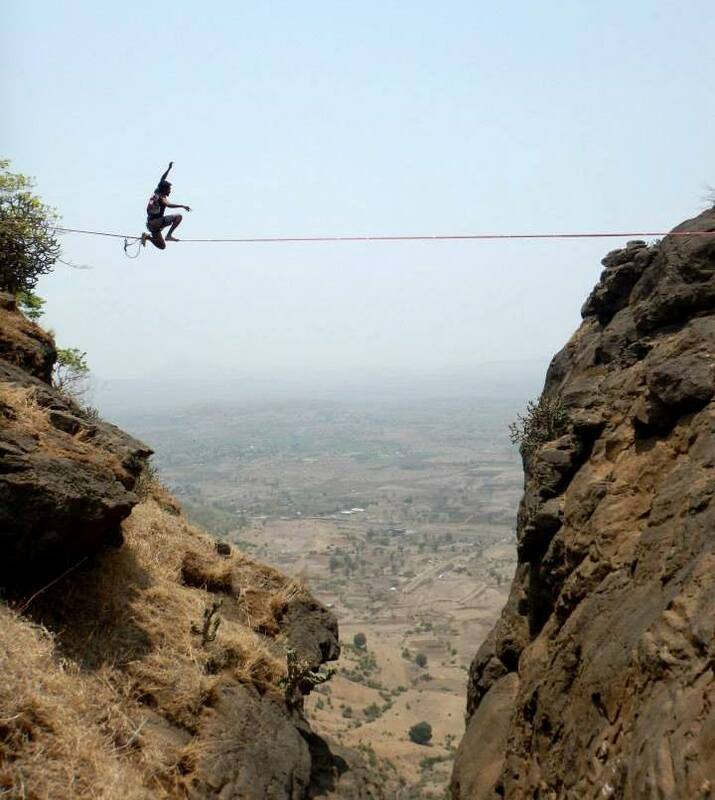 Bhupesh Patil is a young slackliner from Nashik. In May-June 2015, Bhupesh was at Naneghat where a crew of climbers from Omniterra, a company anchored by Mumbai based-climber Mangesh Takarkhede, was assisting the advertisement shoot of a popular soft drink. Here, Bhupesh met Richard Khear (Richie) from Mumbai, who was into rock climbing. Late August 2015, a tragedy occurred in Miyar Valley, Himachal Pradesh; an area now gaining currency for rock climbs at altitude. Richie who was part of a two person climbing team descending to base camp after a day out on one of the climbing routes on Castle Peak, suffered an accident while abseiling. He plunged a significant distance down and lay badly injured on a rock ledge that was still very high up from the ground. By the time rescue teams reached him, which was almost a week later, Richie was no more. The news rattled Mumbai’s climbing circles for Richie was well known and popular in the small, tightly knit climbing community. Rock climbers and slackliners are a similar lot. 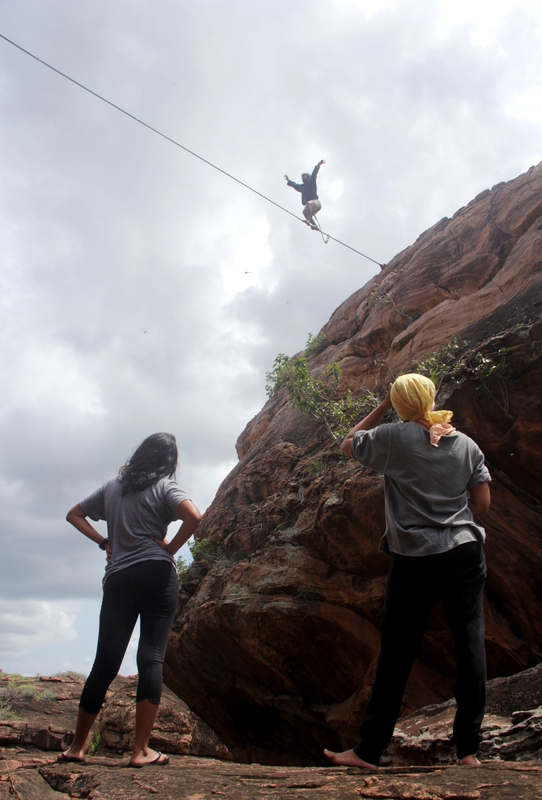 While tight rope walking has an old history (including in India), slacklining is relatively young and reportedly owes its origins to rock climbers (Wikipedia claims it was pioneered by a young rock climber in the US). The two sports are all about balance and heights, they share a relation with webbings and ropes and they bond in the realm of focused action or what some may call – mind over matter. Badami in North Karnataka is one of India’s major rock climbing destinations. On a trip here in 2015, slackliners had noticed the potential for a new line. The second time Bhupesh and Samar were in Badami in 2015, they set up this new high line. Bhupesh walked it first and named it ` For Richie,’ in memory of Richard Khear. Samar followed him on the same line. When you sit on Marine Drive facing the sea, you sense horizon and distance in a city that usually denies you both thanks to its numerous buildings and congested, trapped spaces. Depending on what you are, you may or may not have appetite for distance, horizon and the lure of exploration they inspire. I asked Samar what it is like being out on a slackline. He tried to explain; he failed, I failed. The whole thing is about narrowing down existence to life on webbing. If you are asked to explain such moments of nothing in the head, it challenges language. Slacklife and livelihood by slacklining occupies Samar’s time now. That’s what brought him to the experiential educators’ conclave. Experiential education is all about experiencing things and learning, processing the experience. Basic slack lining is an activity anybody can try and quite safely too, for the line is not very high from the ground. Won’t it sit well in the pantheon of activities experiential education leverages? Samar believes it will. Further there is promise in India for slacklining; the country is overwhelmingly young, the right demography for active lifestyle. The path he has chosen is promising; not easy. For now, it is pretty much like the seaward gaze from Marine Drive. There is the distance, the horizon and from self till horizon stretches one long, thin webbing exploring the unknown; life on a line. He had returned to Camp 1 on schedule to celebrate the conquest of an “ easy’’ 19,500 ft-high peak. Of that, the three who set out to reach the summit of Baljuri had retreated. “ How can that be?’’ Prem Singh asked. I explained to him that weather hadn’t favored us; that I wasn’t the tough mountaineer he thought I was. He loaded his rucksack with some of our equipment and hastened towards Base Camp, probably finding solace in the distraction of a fast hike. When I saw him again, Prem Singh was resting on a distant hill side; a tiny figure against the vastness of the Himalaya. He was still a picture of inquiry; bothersome question in mind, gaze fixed to the sky. I knew nothing I said would alter his perception, assuage his disappointment in me or this expedition he got aligned with. I quietly took out my camera and clicked a photo of Prem Singh resting. It seemed the best thing to do. “ Can you suggest a peak that someone of my ability can attempt?’’ I asked. We were sipping tea at the Rupin Pass. Ravi Kumar, who was the stronger climber, hatched a plan. We could have an expedition in which, he attempted the technically demanding Panwali Dwar and I tried its neighbor, Baljuri. 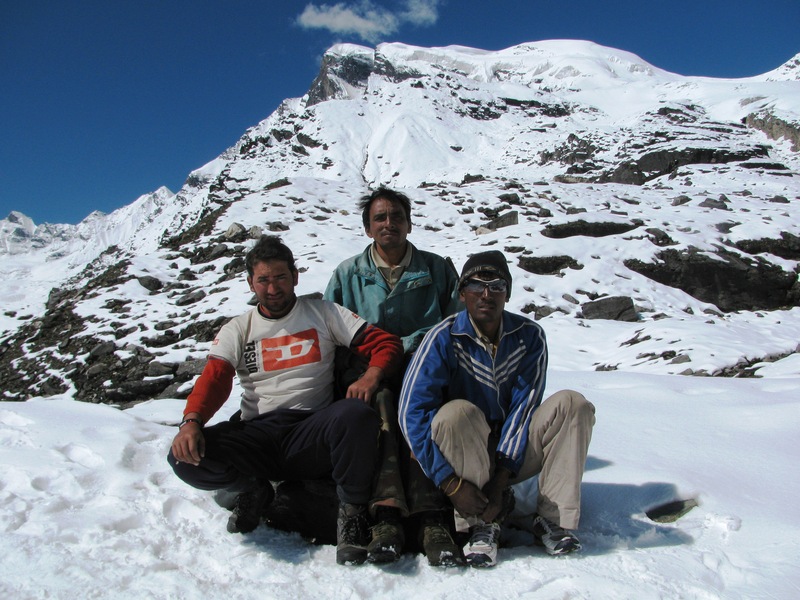 Years ago, Ravi, who worked as an outdoor educator, had climbed Kamet (25,446 ft) and Mamostang Kangri (24,659 ft). After the Rupin Pass trek, he moved to a new job as director of an outdoor school in Ranikhet. Amid changed priorities, Panwali Dwar took a back seat. I continued, a low paid freelance writer, past forty and hauling mid life crisis to the top of Stok Kangri (20,187 ft) in Ladakh. That happened in July 2009 (for more on the Stok Kangri trip please try this link: https://shyamgopan.wordpress.com/2014/12/23/twenty-thousand-feet/). In the flush of that success, Baljuri seemed doable. After all, it is nearly 700 ft lower in height than Stok Kangri – so the idiot in me reasoned. Having neither much money in the bank nor the advantage of strong currency, which foreigners and NRIs enjoy in India, Himalayan expeditions are expensive for me. At the same time, I didn’t want to ask my mountaineering club for help. I found that my friend Prashant was looking to take a break from work in Mumbai. He had less than three weeks leave overall and his last mountaineering expedition had been seven years earlier, a trip to attempt a peak in Zanskar that I had also been part of. We debated if our wish was mountaineering or a high altitude trek. The former is expensive and unforgiving of poor preparation. The drift however was towards attempting a peak. Whoever said mountaineering is a bug got it right. We headed for Delhi and from there to Ranikhet and Bageshwar. “ This is a famous hotel, known even in Delhi,’’ the waiter said as we sat down for lunch at Bageshwar. The hotel was called King Kong da Dhaba (King Kong’s dhaba; dhaba is a small eatery), the name in question not a reference to Hollywood’s monster of a gorilla but the late Hungarian wrestler Emile Czaja, who became well known in India for his bouts with Indian wrestling great Dara Singh and went by the ring name: King Kong. From Bageshwar, where we also picked up Narayan Singh Dhanu, it was a couple of hours drive to Song. An hour’s walk brought us to Loharkhet the first halt on the busy trail to Pindari Glacier. If I remember correct, it was September 2009, technically the end of monsoon but as I would discover through stories done a year or two later, Kumaon had been witnessing a shift in the timing of heavy rainfall. The trail to Pindari is an enjoyable hike and because it falls in the category of relatively easy hikes, it is frequented by many. However rains in these parts can be heavy (in the years between 2009 when the expedition of this story happened and 2015, several rain induced changes to trekking route have occurred in the Pindar valley). It is dynamic terrain. While we were in Ranikhet (we spent a couple of days there putting together food and equipment), it started raining. We reached Song and Loharkhet; it was still raining. Next day we hiked out from Loharkhet in the cold mountain rain and with no accommodation available at Dhakuri, marched all the way to Khati. We were now roughly midway to the glacier. It rained heavily through the night and into the morning. Khati was quiet. Amid the downpour, the only sign of social life was the local tea shop. We took a room close by and hung around the tea shop. News came of landslides scarring the trail ahead and bridges washed away by furious mountain streams. In the distance, the roaring Pindar River was a constant drone. Tourists retreated. Mule traffic stopped. For hours, porters, muleteers and mountain guides sat holed up in the local tea shop, discussing difficulties on the path ahead. Fueling it was the absence of people on the trail to Khati from the glacier. That half had run cold. Bored, we joined those gathered around a fire at the tea shop. Given the rain induced-shutdown, people smoked, played cards; those into gambling sat separately in a closed room from where periodically shouts and arguments erupted. All the talk was about gloom. We waited two to three days. In that time, some hiking teams stuck here and there on the route, managed to return. Crucially, two new ones turned up – a team of hikers from the Indian Air Force (IAF) and a team of American students from the school managed by Ravi Kumar. Then two shepherds walked in from the glacier side with details of the ravaged route. Bit by bit the mood altered. From speculating wildly, Khati graduated to having information and new teams that had energy. From talk of gloom and doom the chatter at the tea shop shifted to jokes and optimism. It was still raining when we left Khati, large IAF contingent up front, our small team in the middle, the Americans behind – enough humans to bulldoze the trail back into shape. At every snapped portion PWD workers, hikers and villagers worked together to push rocks and logs into place. Footstep after footstep slowly stabilized the path. We were strong hikers, decent at hauling load. By early evening, we were having tea with the hermit who stays at Zero Point (as the Pindari Glacier area is called); late evening we were at Base Camp, a shepherds’ dhera or stone hut. It was a lovely place. This was also the first of several mistakes on this expedition. Having lost days to rain and with the climbing window narrowed, we had walked straight from Khati to Zero Point in one day. That was elevation gain ideally done in stages. Neither the IAF team nor the team from the outdoor school rushed up. They took it slow. Three people anchored my team. Every time I worked with Jeetender Singh Rawat (Jeetu) on a high altitude trek or wilderness camp, I had enjoyed the team work. He was a good friend to have in the mountains. At my request, Jeetu had come from Uttarkashi to oversee the team’s food. He was a Garhwali on his first expedition in Kumaon. Narayan was among Khati’s best known mountain guides then (he has since become a businessman living in Bageshwar) for climbs in the Pindari region. He had climbed Baljuri before. If Jeetu was the hardy outdoor type seeing wilderness first and climbing second, Narayan’s approach was just the opposite; at that time he was all about bagging peaks and passes. The two got along well. We needed a man at Base Camp who could range between there and higher camps – enter Prem Singh, Narayan’s brother. It was a good, compact team. We were camped across the Pindar River, opposite the hermit’s ashram, glaciers in sight, everything in the lap of an impressive arc of peaks. Two things qualified the area – it was historically important and the mountains were close, dominating by sheer bulk. Right behind the dhera, occasionally visible above the immediate ridge was Baljuri. Its summit sloped to a shared link with the steep pyramid of Panwali Dwar (21,988 ft), which in turn led on to Nanda Khat (21,816 ft). The presiding peak of the area, if there was one, would be Changuch (20,863 ft), bang in the middle of the arc. Next to it, on the same base, stood Nanda Kot (22,641 ft). In the corner between Nanda Khat and Changuch was Trail’s Pass. 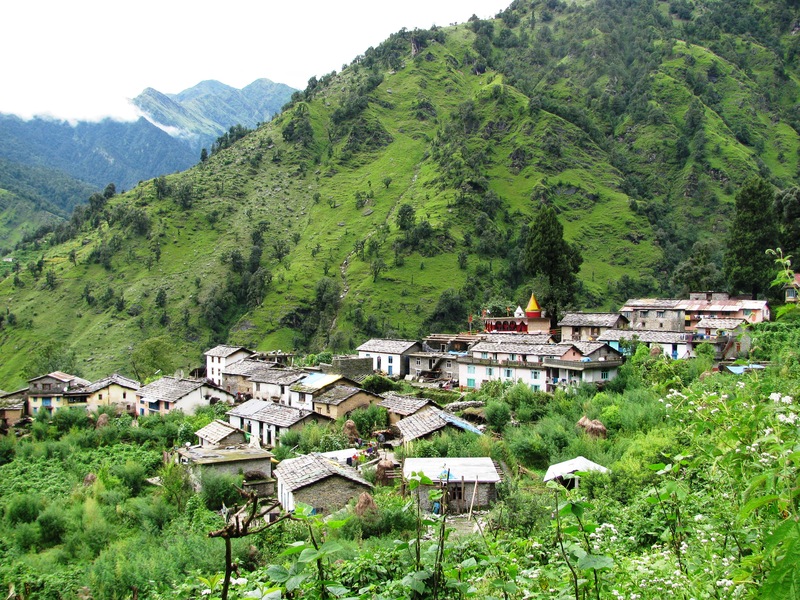 Between Nanda Kot and the mountain guarding the hermit’s ashram was the route to Laspa Dhura (19,513 ft). If you gained elevation on the nearby slopes you could see the twin peaks of Nanda Devi (25,643 ft) behind this immediate rim of peaks. Of these Panwali Dwar and Nanda Khat are described as being on the protective wall of the Nanda Devi Sanctuary. To that extent Baljuri, which has a common col with Panwali Dwar, may also be seen as part of it. Nanda Kot was outside the wall. Peak climbing is done in stages, splitting the route into a series of high camps. Each camp has to be stocked; so you carry up all that is needed, the haul being most severe in the first stage and depleting in weight – albeit rising in strain due to altitude – from there on. Besides the core stocking role, these load ferries serve another purpose. They help you acclimatize. Staying active through work is the best way to acclimatize and the recommended model is to work high and sleep low or open a high camp but return to the altitude you left, to sleep. We were in the classic jam that visits Indian expeditions. The travel to the mountains, putting together final provisions and gear, the heavy rain – all had eaten up days. If you love the mountains, then you would hate the Indian predicament. We rush in to altitude and rush out, expecting to climb a peak in the same clockwork style of a Mumbai rat race. One rain, snow storm or landslide and the schedule is upset. Ideally, you should come with time on your hands. This helps you acclimatize and work around problems instead of forcing an attack-or-retreat scenario on every hurdle encountered. The hermit reminded us of the folly in not having at least one rest day at altitude. Swami Dharmanand Giri was an interesting person. He lived alone in that wilderness and was a name known to trekkers and mountaineers frequenting the region. 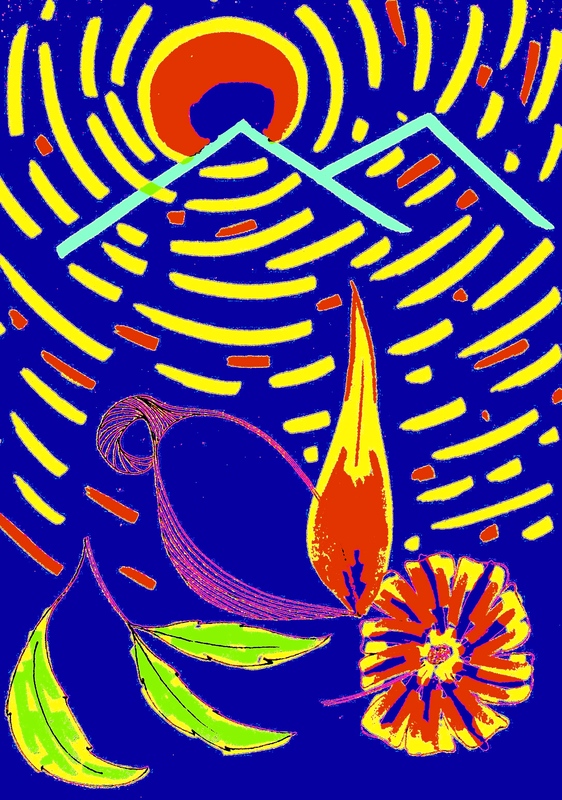 At his own pace, the hermit had done much walking around in the Himalaya. One such high excursion periodically undertaken lay right behind his ashram. On the high route to the Kafni Glacier (not to be confused with the popular lower one from Dwali), at an altitude another thousand feet or more from his ashram, he kept a small prayer hut. The advice of such a man on the need to rest and recover was not to be ignored. The best we could do for rest, given the limited days at our disposal, was open Camp 1 and return to Base Camp early enough to rest the remaining part of the day. However, on the first day of the climb, the long haul with load to Camp 1 proved tiring for some. We were forced to dump the load at a midway point and retreat to Base Camp in bad weather. That rain was still very much around. The next day we just about made it to Camp 1. It was snowing. Kitchen was under a small tarpaulin sheet tied to a pile of stones and trekking poles. Jeetu crouched under it making tea. The MSR stove – designed to be multi-fuel – choked periodically on Indian kerosene. Amid this, a huge blob of dense, white cloud enveloped the camp. Below in the valley, like roots for this giant cloud straddling everything around, black clouds sprouted; they resembled those spirits from a Harry Potter movie. I feared we were heading for serious trouble. But it merely kept snowing. By night two people were down with headache. Altitude sickness can affect anyone. Jeetu, one of the affected, was uncomfortable, lacking appetite and feeling nauseated. We decided that if he didn’t recover by morning he would go down to Base Camp. Prem Singh having helped with the load ferry had already gone back promising to return the day after, by when, he estimated, the peak should be in the bag. Was Baljuri’s claimed easy peak-reputation, a load in my backpack? I wonder. This I will say – when you are on a peak, what others said of it is immaterial; there is only what you experience. Our medical kit was well equipped. Its contents included medicines for altitude sickness, which can become a serious condition. High altitude sickness is not something I feel confident to tackle for the simple reason that patients can mix it up with ego; they may deny the existence of a condition for fear that it will jeopardize one’s chances of attempting the summit. You can notice symptoms even if a patient is in denial mode but steps thereon require you to be assertive. Next day nobody complained of headache. We seemed fine. All the same I began the day highlighting the importance of honest admission as best precaution for altitude sickness. I was leader but thoroughly lacked the assertiveness to ground anybody. That’s a flaw in my leadership style. I hate assertiveness because although it may serve an immediate purpose, a whole world trained to lead assertively is one noisy place to be in. It is a zero sum game unless you are in the business of selling loudspeakers or are happy following the loudest. Even if I tried being assertive on the mountain, I wouldn’t succeed because at some point every achievable summit plays games with the climber’s ego and in India, certainly the male ego. Knowing how much success defines you in rat race, you want the top. So who will admit weakness without argument? We want the one shot we have, to deliver everything. In my eyes, Jeetu showed courage and excellent conduct by letting others know his condition. The two routes – from Base Camp to Camp 1 and from Camp 1 to Camp 2 – were poles apart. The first route had been long with snow only toward the end. Its biggest challenge had been a stiff mountain face, where the going was over clumps of long grass. It could easily take a man’s weight near the root but step on the blades by mistake and off you slipped. The second route was less inclined on the whole but the snow cover ranged from ankle deep to knee deep. At a few places it was thigh deep for me and I had to lift my leg with my hands and keep it in the next hole excavated by the person ahead. It was laborious plodding. 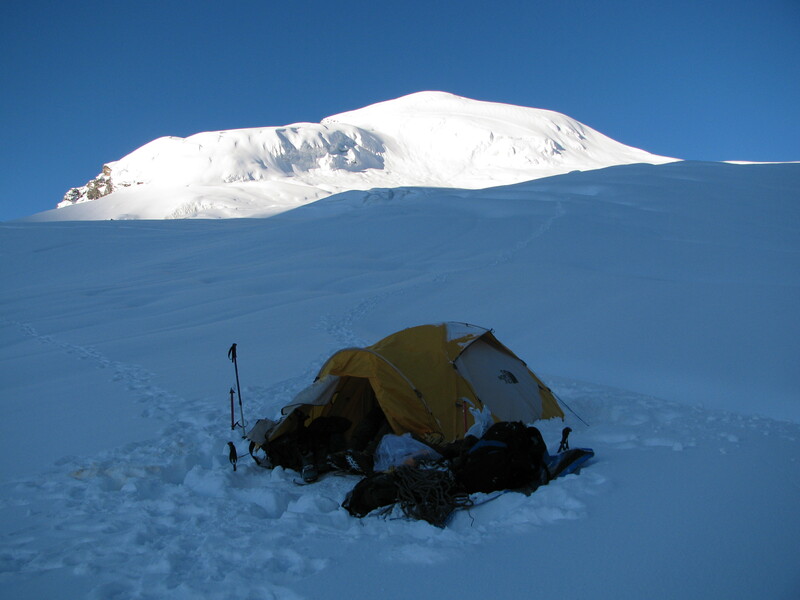 We were almost at Camp 2 when bad weather struck. It snowed reducing visibility. 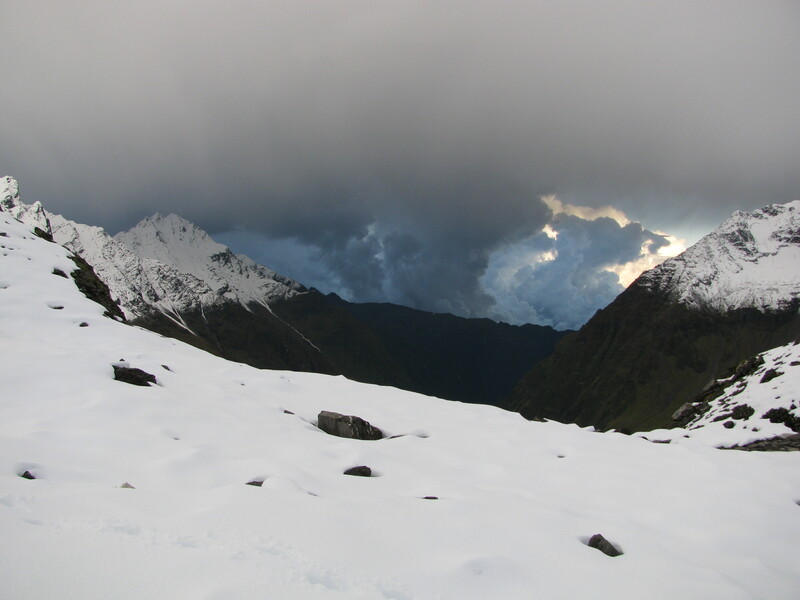 Eventually we struck camp toward the Panwali Dwar side but adequately off that mountain to escape its avalanches. Courtesy the prevailing weather, the steeper Panwali Dwar was sending down avalanches. Using ice axes we prepared a level ground on snow to camp. The last man arrived just as the tent went up. 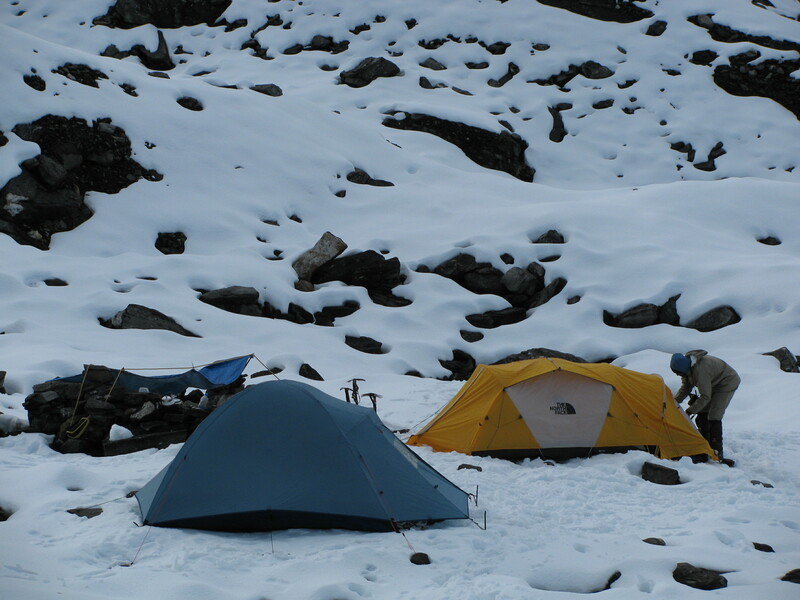 To save weight, we had brought only one tent up to Camp 2. It was a big mistake partly fueled by this ever present notion that we would climb Baljuri and be back in a jiffy. That evening a few things worked, many didn’t. What worked well was the sight of Jeetu back in action and my stove. Jeetu in good spirits is contagious energy. We had carried unleaded petrol as fuel for higher camps. Powered by a new fuel bottle containing unleaded petrol the MSR stove hummed melting snow for drinking and cooking (I now use only petrol – unleaded if possible – as fuel for the stove). What didn’t work was team morale. The exhausted, looked dazed and disinterested. To top it, I had blundered hauling up just one tent. Before any summit day, rest is crucial. My tent could take two large people or three normal people. We were three big people and one small person. While tents do warm up with human presence they gather condensation from within. Most tents handle this well at design capacity but when overloaded you can’t blame a tent for harvesting moisture. I was at the side, where this harvested moisture aggregated. I was cold, my sleeping bag was wet and I was unable to get the others to yield dry space. For a while I sat and slept. I spent the rest of the night either curled up in a ball or up sitting. That was when I first sensed the expedition had failed. I distracted myself `dusting’ the tent (shaking the tent fabric) so that the snow accumulating on top slid off without weighing down and damaging our shelter. It kept snowing. At 4 AM, three of us left for the summit. It was cold; the terrain, white. We plodded on. The shared ridge of Baljuri and Panwali Dwar seemed very reachable. Once you get to that ridge, it is a long plod on snow to the summit; a concern probably being the true nature of the other side of the ridge, which you don’t see from Pindari. 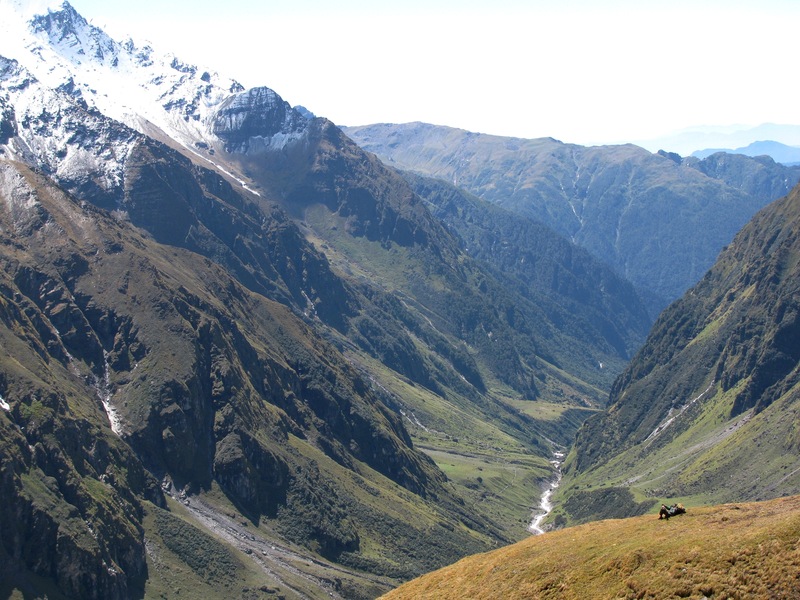 Seen from Sundardhunga – the valley beyond the ridge – this `other side’ is rather steep. This was my estimation. You don’t fully know features on a mountain till you are actually up there. At about 5.15 AM, following a short, steep climb Narayan who was leading the way halted. We were on a ramp at the base of the slope leading to the shared ridge. The ramp was progressively cantilevering. Beneath was a large hole, a big pool of ice water. In the light of our headlamps, it seemed to stretch from the side wall of Baljuri to the side wall of Panwali Dwar. Narayan was taken aback at what he deemed changes to familiar route. The only way out from this obstacle lay to the Panwali Dwar side, probably going up that mountain a bit and skirting the pool to access the shared ridge beyond. “ This isn’t how it used to be,’’ Narayan said. We made an assessment and agreed on two constraints – first, there was only so much we could see with headlamps. We could find an alternative route once there was more natural light. That meant one day to explore, another to attempt the summit. Second, Panwali Dwar had been sending off avalanches (mostly small ones, sort of resembling how you would dust the snow off your jacket after a storm) and snow condition nowhere on that mountain, recommended exploration. What we needed to do was – give the mountain enough time to settle itself. What we did not have as a team was exactly those additional days. Not only had we lost days in the walk-in, it also sapped some of the initial momentum. We were tired. We didn’t want to endure the wilting morale either; I was sure I didn’t want to repeat a night like the one just past. Both Narayan and Jeetu looked at me. “ Let’s call it off,’’ I said. We stood there for some time looking at the summit, so achievable had it been a different set of circumstances. We broke camp and headed down the mountain. It was a fine day, the first one with confident sunshine in a long while. At Camp 1, we met Prem Singh. His broad smile anticipating news of success gave way to puzzlement over how the summit evaded us. Back at Base Camp, shepherds dropped by for conversation and tea. They had lost one sheep after it slipped and fell into the rapids of the nearby river. Recovered quickly but too late for life, the dead animal was now mutton warming the shepherds’ evening. Prem Singh decided that we deserved to eat well. He went over to the shepherds’ and returned with a portion of meat. Jeetu joined him to cook the mutton. On the way back, at Dwali, Prashant and I took photos. Battered by rain, cold and strain, we looked beat. In the outdoors, that plight is life restored to simplicity; it is a `reboot’ with all the cookies and viruses that clogged the system, removed. You feel happy. A month or so later in Mumbai, I received a call from Narayan. He said he had reached the top of Baljuri yet again, this time with a team from West Bengal. “ I still don’t understand what happened to us. Why didn’t it work for us?’’ he wondered. Not long after that phone call, I met Krishnan Kutty, who, like Ravi Kumar, ran an outdoor education facility. He had been on Baljuri before and I had mailed him for route details ahead of the expedition. Kutty had emphasized the need for time and patient acclimatization, both of which, we flouted. I apprised him of the failed expedition. He listened carefully and then said, “ It appears to me, you turned back at the bergschrund.’’ That is the technical term for the point where a mountain’s glacier breaks off from the stagnant ice of its higher slopes. It typically manifests as a big crevasse. Crossing a bergschrund or finding a way around one is routine for mountaineering expeditions. 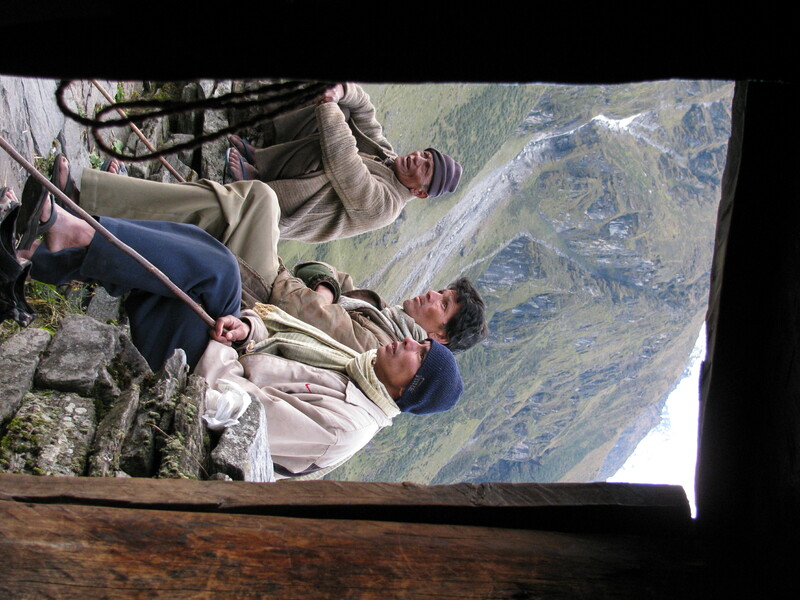 In September 2009, before leaving the Pindari Glacier region, I went to meet the hermit. Used to waking up early in the morning, he said that on the day of our summit attempt he had seen tiny dots of light heading up the glacier for the common ridge linking Baljuri and Panwali Dwar. It made me happy. That was a nice picture; usually found in accounts of mountaineering – the classic summit push under headlamps in the darkness of a mountain slope. It felt nice to know that I had been in one such picture. In 2009 I found myself at Puthiyathura, a fishing hamlet on the outskirts of Thiruvananthapuram. In my many years of knowing Kerala’s capital city, I had never ventured into these parts. 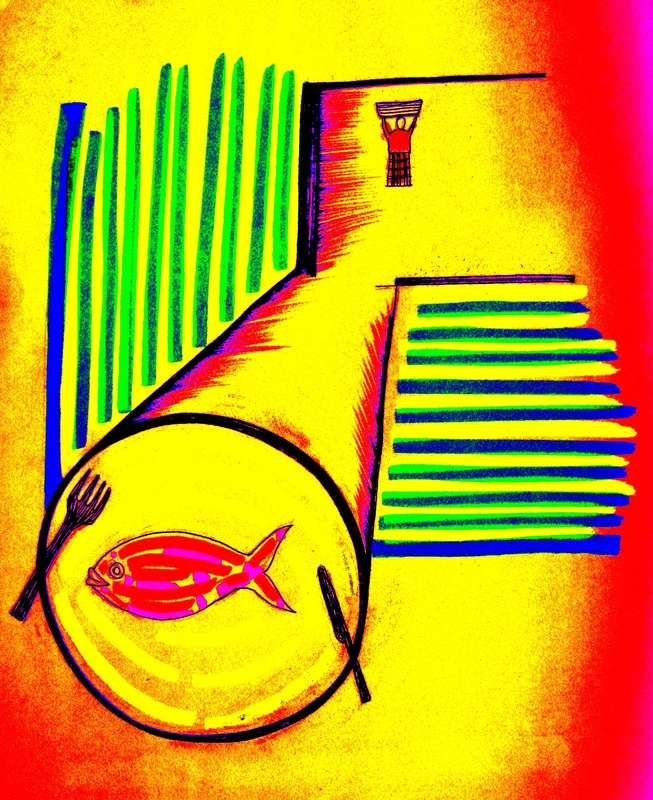 The fish reached the refrigerator in our home, carried all the way by a fisherwoman. You saw the fisherwomen all over town, hurrying along at a fast pace. What we never knew was why she hurried. She too had family; she had left home early and had that far to get back, before dark. Wanting to save the little she earned, she walked; a hurried walk. The only time the fisherwoman’s home captured our concern was when the police resorted to firing to disperse clashing groups. In the days I attended school and college in Thiruvananthapuram, the city’s fishing hamlets witnessed clashes. When a fisherwoman came to our home after one such incident reported in the local papers, my mother would ask her about it. Some of them talked at length. It was, I guess, a venting, unloading one’s mind of life’s burdens to a fellow woman. Some others spared just a few words. As the crow flies, I lived maybe three to four kilometers from the sea. We went to the beach on weekends, enjoyed the sea breeze, wet our feet in the surf, had the hot, roasted groundnuts sold by vendors and returned home. Amid the silhouettes of fishing canoes drawn up on a sunset-beach, would be people relaxing over a chat or card game. Once in a while a kid or two came prancing down from the shadows towards the waves, jumped into the surf, swam about confidently and went back to the shadows. 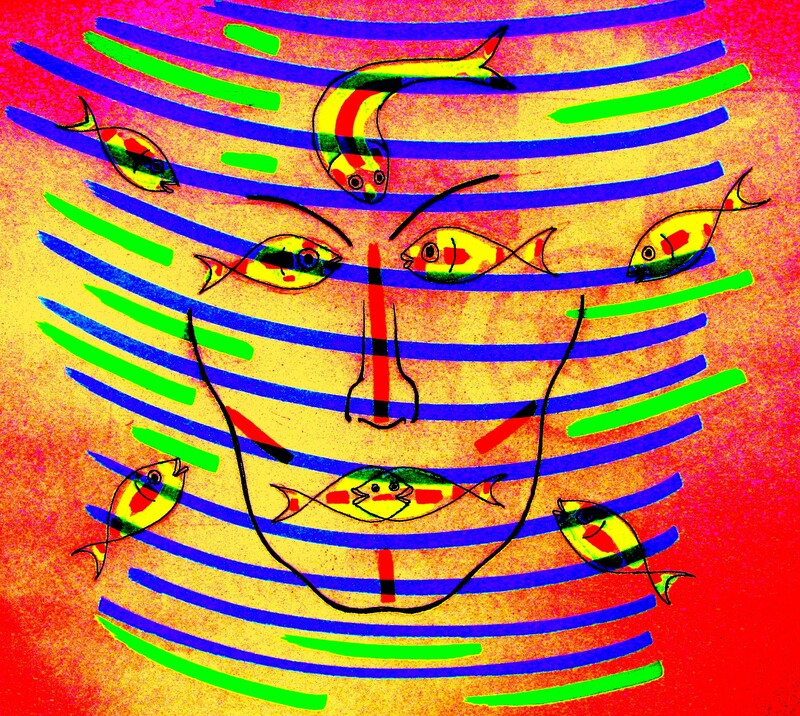 They were the people of my fish. Years passed. I began catching up on things I didn’t do. I wanted to venture out to sea in a fishing boat; watch fishermen at work. My sister Yamuna, who had studied sociology and worked with communities, pitched in to help. She had worked before in the Puthiyathura area. She put me in touch with the fishermen. Several phone calls later, we had a trip scheduled. Then, Varghese who was to be my guide cut his arm and so the first attempt got called off. The second one saw us all on the beach staring at an angry sea. The water was grey, turbid toward the shore and the waves crashed with a dull resonant thud, which has always been the audio signature of a south Kerala beach. On that particular day, the thud was too strong for comfort. “ We won’t have a problem,’’ Johnson said referring to himself and his fellow fishermen, “ but a newcomer, if required to jump off the craft on the return may end up in trouble.’’ To put it in perspective, the coast towards the south of Kerala slopes steeply into the sea. You can find waist deep water within striking distance of the shore, neck deep trifle beyond and start swimming around where the nearest wave arches to crash. In contrast, beaches in Gujarat have extended shorelines; at low tide you can walk far out to sea. This is the secret to what was once the world’s longest stretch of ship breaking yards at Alang. You run the ship in on its last burst of energy and ram it into the shallows. At low tide, the steel hulk stands exposed for scavenging like a castle bereft of its moat. Unlike Kovalam, which has a protected cove, at Puthiyathura the beach was a straight line exposed to the sea’s fury. Here, I may be able to launch off in a boat in rough weather but on the return, devoid of the skill to jump out of the boat in time and swim, risked getting hit by the craft, which would be tossing and pitching in the waves. “ The sea should be calmer,’’ Vincent said during moments stolen from his perennial focus on the auction happening on the beach. The auction was a miserable sight. On display was a meager collection of fish hardly echoing the famed plenty of the sea. “ There is nothing left to catch there,’’ Vincent said. The time I was at Puthiyathura, an advertisement for the Grand Kerala Shopping Festival in the newspaper announced up to forty kilos of gold to be won if anyone bought the precious metal during the festival period. That’s twelve kilos shy of my body weight and many, many times more in value than my person. In a country recognized as the world’s biggest gold importer, Kerala is one of the biggest retail consumers. I suspect Kerala’s love for gold has much to do with an underlying conservatism. The advertisement for the shopping festival dutifully highlighted the logic. It asked: which other investment is as secure as gold? The image in the advertisement about the shopping festival showed five fishermen folding their nets on a beach. The sea braced itself into a wave in the backdrop; large, shining gold coins morphed into the photograph tumbled out from the nets – a haul of gold. The caption said: Swarna Chaakara. It was a play of words and imagery. Swarnam in Malayalam means gold. Chaakara is the phenomenon of mud banks that occur along the central Kerala coast bringing with it shoals of fish. Old timers distinctly remember it for the flurry of activity it brought on the beach. Years ago as a journalist in Kochi, I had traveled south to Ambalappuzha to witness a chaakara. Venu, my colleague from the Alappuzha bureau and the person who loaned me a wonderful collection of Hemingway’s essays to read, accompanied me on the trip. I reached the beach expecting festivities and jubilation. The mood though was matter of fact. More like – been there, seen it. I was the only one straining to see a great story for a new generation. Most people on the beach probably saw it as a stroke of luck to pay off debts. That was in the early 1990s. As an introduction to the economics of fishing that laconic attitude was the right initiation. In the Malayalam language, chaakara has evolved to become an expression of plenty. And times of plenty are rare. Whichever way you look at it, fishing is a tough business; hardly the stuff of gold. For most of us landlubbers dreading the fury and unfathomable depth of that vast blue expanse, returning safe from the sea is accomplishment enough. 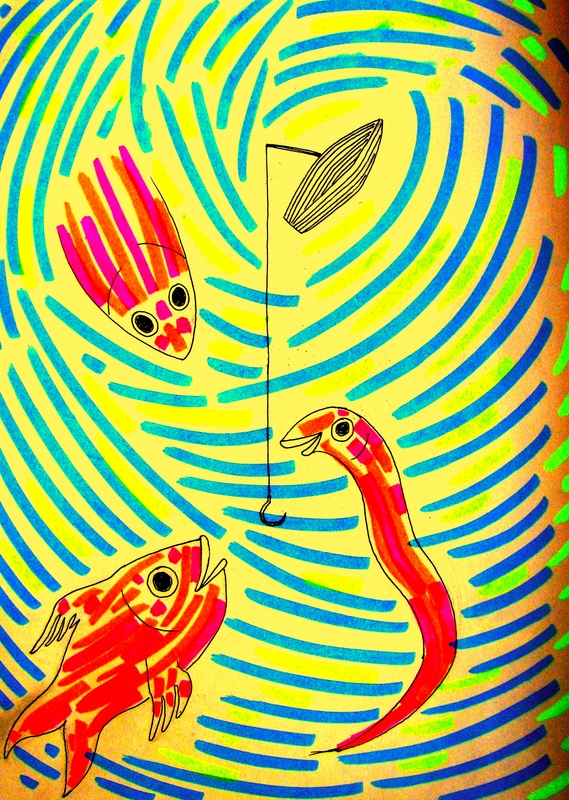 For the fisherman though, returning alive and empty handed is an invitation to accumulate debt, suffer from it. Behind each outing into the sea is a string of expenses, ranging from the cost of nets and fuel to the cost of hiring a boat if you don’t have one. A simple inquiry on the beach would reveal that these costs are not tiny even for your wallet, leave alone a person struggling to make ends meet. In a low capital environment like the fisherman’s beach, these expenses are incurred and paid for with promised claims on the catch. Thus the first right on catch is rarely the fisherman’s; his is typically the last. The math at its core is simple – if you spent a thousand rupees and fetched catch worth six hundred, you paid off the equipment providers on the basis of a local ratio, kept a small portion and started your second voyage with debt in excess of four hundred rupees. That is not just simple; it is simplified for atop that debt would come the fresh investment for the second trip, which may be another round of borrowing. Until some time back, this atmosphere of frequent debt was accentuated by loans from money lenders arranged at high interest rate. 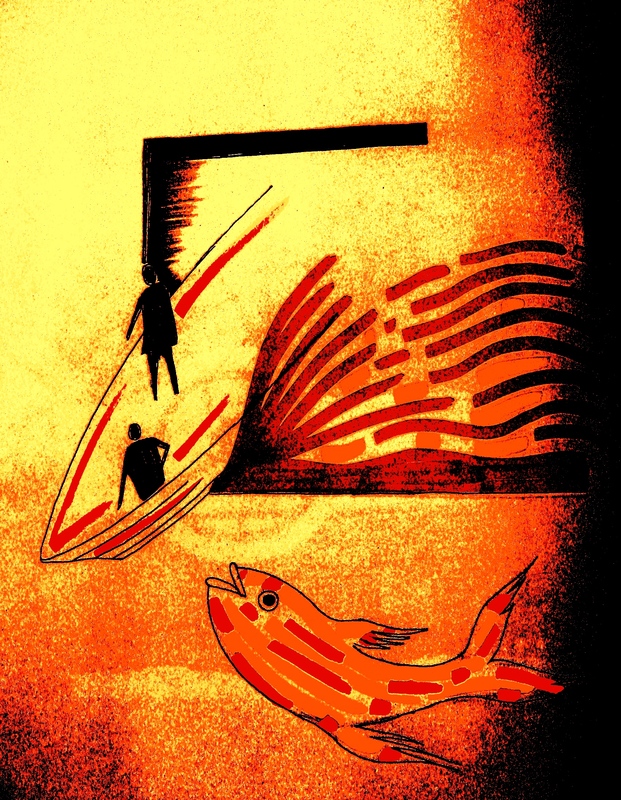 The rise of self-help groups may have partly addressed some of these monetary difficulties but there has been no escape for the fisherman from the basic model of fishing. The sea loves its unpredictable nature. It had anyway spoilt my chances that day of the second attempt to go fishing. Confined to the shore, Vincent and Kennedy, both activists for the fishing community, took me around to see the day’s catch. Prominent on the Puthiyathura beach were plates of normally overlooked cartilaginous fish, the sort seen hiding in the sands of the sea bottom on National Geographic. Also around was fish, dead in a different way – it was already dead and floating on the sea when the fisherman hauled it in. This was fish rejected at high seas as unwanted collateral catch by large trawlers. With few fish to come by, the trawlers’ refuse was also getting cleaned and sold. The woman cleaning the lot for sale stayed absorbed in her work. She didn’t look up at either Vincent delivering a commentary on her plight or me, clear stranger to the beach, standing there and listening to it. She seemed indifferent to the whole world. Two days later, I made a final attempt. This day and no more on this visit home, I had promised myself. Bad luck threatened from the start. The global economy – certainly the US and Europe – was in recession; India was claiming to be free of the disease, yet showing signs of it in every business update. At that most blessed moment when thousands were losing their jobs worldwide, the country’s well paid oil company employees decided to go on strike. Simultaneously, by design or coincidence, a nationwide transport strike began. Soon fuel stocks at retail level reduced to a trickle. Long queues of vehicles appeared in front of petrol pumps. This was the situation at the city bus depot that morning, many buses were caught in queue for fuel, some trips were cancelled and some that ran were way behind schedule. That was the case on the route I was to take. Finally I got a slow bus. We ambled along at leisurely pace, as these buses have always done in the city of my childhood. In due course the breeze became sea-tinged and the sky above the coconut palms betrayed that openness so characteristic of proximity to the sea. Christian churches frequented by the fishing folk appeared and in the courtyard of one, reflecting the charismatic brand of religion followed by many in these parts, a lone man walked around, gently dancing, swaying, and holding aloft a leafy tree branch. He seemed to have stumbled upon some blessing or may be as part of the blessed, he was blessing the world – who knows? He seemed happy anyway. “ It is a fine day,’’ Vincent said on the ocean’s edge, the big blue expanse looked sleepy, almost tranquilized and prayed to stay so for a novice to sail its bosom. My friend Swarup had helped me secure a life jacket. I put that on. It was an effort pushing the wooden boat in. The moment it hit the water Johnson fired the outboard engine. We punched ahead through the waves and shot on for a long time, till all sign of shore disappeared and we were in the calm waters of beyond. Here, more than from ashore, you notice the bulk and immensity of the sea. I watched three men drop long lines to catch whatever fish they could. I had expected to see a net or two. There was none. I suspect my companions on the boat took the outing less as fishing and more as an assignment to satisfy my curiosity for their world. The lines dangled in the water, managed by sensitive fingers alert for the slightest tug or movement. Every few minutes a line would be drawn in; several hooks empty, a fish or two being all that was caught. The sea may have turned calm but the fortunes it held, hadn’t changed. The few fish getting caught were all the slimy, grey type. A couple of them seemed painted at some art school but hardly the variety for eating. Save one type – red in color, with white spots that the crew said was tasty to eat. Yet none commanded value in the market. Here and there a creature resembling the seer fish or mackerel jumped out of the water but that was it; it wouldn’t be fooled to bite. Still in that highly diluted and watered down version of fishing’s thrills, I could sense the nature of engagement. As he drew up hook after hook where the fish had eaten the bait and escaped getting hooked, Gregory said aloud to himself, “ crafty characters.’’ By noon we were done. A small pile of low value fish lay on the boat’s floor. George, Clement, Johnson and Gregory sat pensive near the lone outboard engine. They had just concurred that given their life experience they would rather have their children educated and doing something else. “ In this profession, those who lost, outnumber those who gained,’’ the older, quieter, Gregory said. The sea slapped softly on the boat’s sides. Even at such gentle times, the swells resembled giant aquamarine saucers; you sank into one and crested at its edge like a two second-light house. At one such cresting, I saw the most amazing sight – a man poised atop a slender catamaran, all alone and so far out. Had it been space, he would have been a planet all to itself. 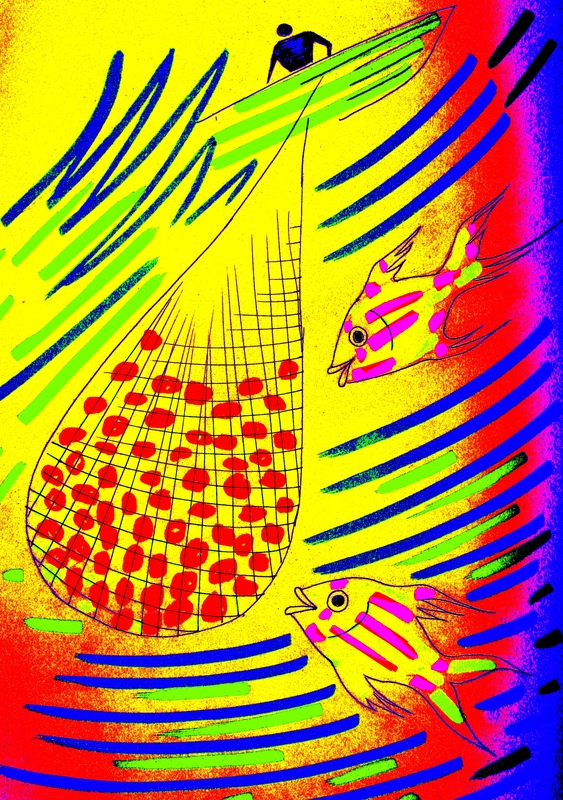 Here, he was a world on two logs drifting by, lost to the rhythm of a work getting longer and longer for want of fish. He would sit, stand, squat, and pull in a net – all on a foot-wide platform liberally washed by the blue sea. The minimalism of his life clothed him and two or three others like him that I could see scattered wide apart in that area; the briefest pair of shorts or a section of an old lungi wrapped around the waist and ending well above the knee. That bare existence on a fragile stick near submerged by the sea was apparently fundamental to anyone’s evolution as a fisherman. “ You start on a catamaran,’’ Gregory said. In the boat Clement kept working, as though working against time, making good use of the little time, any time, he had. He was usually the last to draw in a line from a given spot, big hands reeling out the line and feeling it constantly for the faintest of tell tale tugs. Chaakara doesn’t happen this far south in the state, nor is plenty at sea anymore the plenty of old. Unless that is: some lucky fisherman borrowed money, bought gold and struck a Swarna Chaakara at a city jeweler’s shop. George would have liked that thought. 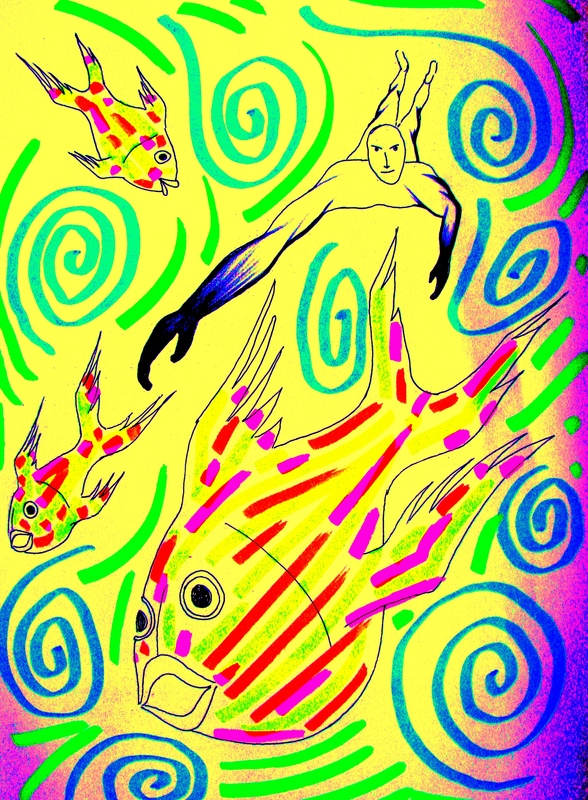 Standing at fore with a hungry gaze seaward for any sign of fish, he seemed mad enough to indulge the absurd. He was getting restless. Suddenly, the placid sea and the hours spent fishing futilely, got to him. He whipped around, “ Let us go back to land, eat and get drunk! What do you get here?’’ My thoughts hung for a second on his last observation – what do you get here? I had heard that before in the mountains, where the sight of ocean is typically part of a lucky journey. 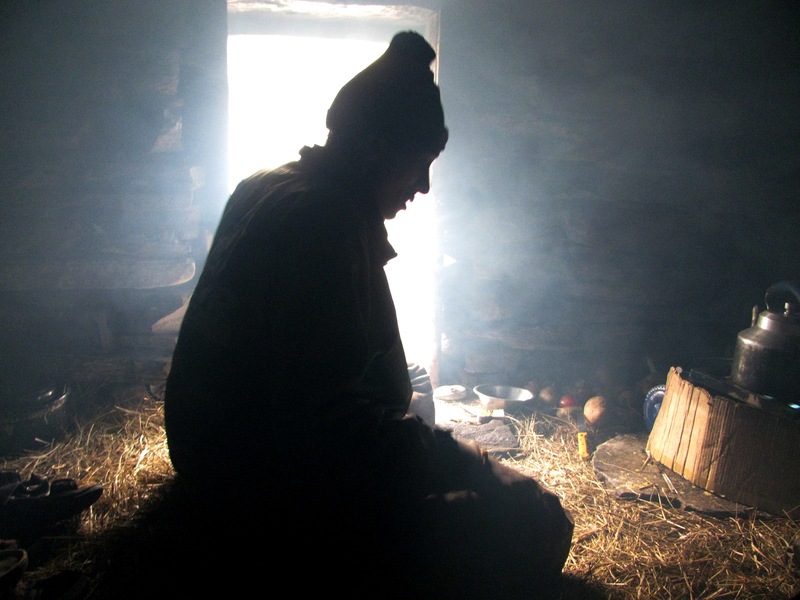 Memory of the sea – if seen at all – is a good subject for conversation at mountain villages. There too, they ask with envious glance cast towards the plains – what do you get here in the mountains? Everybody wants to be somewhere else. Johnson warned of low fuel. At the turn around point roughly eight kilometers out at sea, I gazed at the water all around and couldn’t resist taking a dip. I took off my life jacket and lowered myself over the boat’s side into the water. Then I pushed off. It was the least I could do as a puny statement of intent before the vastness of the surrounding blue, the length and breadth of it, the depth of it. “ Don’t go too far from the boat. The fish here is big,’’ Johnson said, half in jest. My conspiratorial mind immediately switched to National Geographic mode. Below me should be tiny teeth, big teeth, sharp teeth, suckers, stingers; there was a world of murderous characters lurking below. The quality and quantity of danger was directly proportionate to seventy per cent of the planet being water and that watery world being three hundred times – according to some estimates – bigger in volume than the land mass inhabited by terrestrials. With large bait splashing around in the water, all we needed on the boat was another aspirant for the World Press Photography award. The sea had been calm that day; the swim felt easy as though in a gigantic swimming pool, sole concerns being that sense of terrible depth and the inevitable drift of the boat away from you, away from you. For someone whose longest swim is a struggled lap in the swimming pool that specter of the boat slipping away evokes panic. In the ocean there is nothing to grab when starved of endurance, except water. Vincent remembered a day some twenty years ago when the sea was far from calm. He had been out with a crew that included his father. They had just pulled in the net laden with catch, when the weather turned bad. The furious sea flipped the boat throwing everyone into the cold water. He reasons that things would have been different had they not pulled in the laden net as it may have worked as a stabilizing anchor. Each time they steadied the boat, the sea flipped it till over a series of capsizes, the net wound itself around the boat. It was a mess now, a tangle of men, boat and net in the deep waters of a furious sea. Night came. At some point during all that agony, the cold water proved too much to bear for one of the crew and he died. For a while they kept the body in sight, lashed to the remains of the boat. By day break, they had lost two people – the second being Vincent’s father. Luckily for the crew, they were discovered by a boat that had set out from the Tamil Nadu coast, further south from Puthiyathura. “ That boat just burst out from the surrounding swells,’’ Vincent said. He didn’t go back to sea for a year and when he did, the memory of the accident shadowed. Back on land, Johnson rather apologetically, presented me with a bill for the fishing trip. In tune with the fluctuating fortunes of his work, he said, “ had the catch been good, I would not have insisted.’’ I couldn’t argue, the fish said it all. “ That’s alright Johnson,’’ I said. Before I left Thiruvananthapuram for Mumbai, the local newspaper reported on one of the winners from the Grand Kerala Shopping Festival. It was a fisherwoman who had borrowed money to buy the coupon for the lucky draw. Near South Mumbai’s President Hotel, not far from the high rises that characterize Cuff Parade, is the popular garden called Colaba Woods. Noted for its rich variety of trees, the garden was in the news in early 2015 due to fears that a proposed metro station may eat into the property. Colaba Woods has a shaded jogging track. “ A round of it is about 400m.That’s my all time favourite place to run,’’ Girish Mallya said. Born in 1975, he used to stay at Colaba’s Navy Nagar. He was a good cricketer in school with affection for fielding. It was when he finished his tenth standard that he took to running, visiting Colaba Woods three or four times a week. Girish does not stay in the neighbourhood anymore. But Colaba Woods was where he gained his running legs. “ Those days there were very few runners,’’ he said. The running continued even as the young man shifted to Manipal for higher education. The university town in Karnataka’s Udipi district was less busy than today; it was an inviting place to run. Girish ran three to five kilometres, twice or thrice a week. After completing his MBA from the T.A. Pai Management Institute, he was picked up through campus placement by Tata Donnelly for a position in Mumbai. The company would later become Tata Press, then Tata Infomedia and finally Infomedia, at which point Girish left it to join Next Gen Publishing where he has remained till now. The first major running event that Girish ran was the first edition of the Standard Chartered Mumbai Marathon (SCMM). The year was 2004. He heard of it through a friend and without knowing much about the marathon, registered for the full marathon. He decided to do it his own way. From some months before the event, he referred Hal Higdon’s training program for the marathon and loosely followed it. The first SCMM, struggling to find its footing in the world of marathons, traded every marathon’s traditional early start for proper sunshine. Girish recalled a late start for the race apparently because TV coverage needed adequate sunlight. “ It was a first time for the organizers. There weren’t enough water stations,’’ he said, attributing it to likely focus on elite runners forgetting the existence of many rookie runners. From that shaky start, the SCMM has grown to be India’s flagship event in running, the race with the biggest prize money in the country and the largest marathon in Asia. Girish completed his first full marathon at the SCMM, in a little less than six hours. He has since run the full marathon at every edition of the SCMM. “ I would like to run the SCMM at least 25 times,’’ he said. The upcoming January 2016 edition is the SCMM’s 13th. Another trend with Girish is running the first edition of events that attract his curiosity. He thus ran the first editions of the the Bangalore (Bengaluru) Marathon, the Bangalore Ultra and the Goa River Marathon. He likes the “ uncertainty’’ that goes with something new. “ I like to experience everything first hand without clouding my opinion,’’ he said, adding, “ I watch movies but I don’t read movie reviews. I like it first day, first show.’’ To this, he adds one more parameter – the urge to try something others haven’t tried. On the average, he ran 40-50km per week for training, a modest mileage compared to what some determined runners pile on. “ I believe in conserving my legs and body. 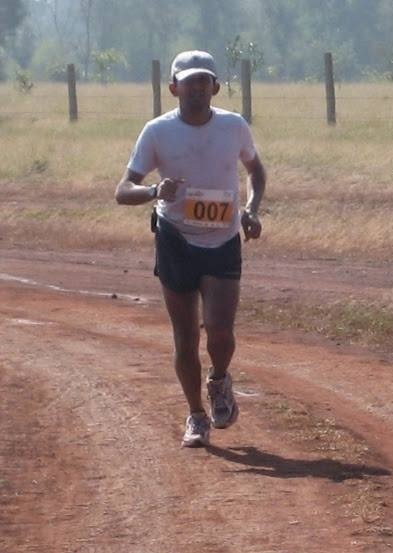 I would like to continue running as a veteran,’’ Girish said. Amid this preference for first editions and going where others haven’t, the second edition of an event made a major difference. But before that, a hark back to the time when Girish was around nine years old and far from frequenting the jogging track at Colaba Woods. The Sahara needs no introduction. It is the stuff of school geography. There can be no description of the planet’s topography without it. Precisely because of that its superlatives engage. Wikipedia describes it as the world’s largest low altitude hot desert. Including the Libyan Desert, its area is comparable to the respective land areas of China and the United States. In 1984, a French concert promoter called Patrick Bauer decided to attempt a solo self-supported journey of 350km in the Algerian Sahara. The passage on foot took him 12 days mainly because his backpack weighed 36 kilos. He required enough food and water for the whole journey. In an interview available on the Net, Bauer has said that prior to this undertaking he had lived and worked in West Africa for two years, selling encyclopaedias to teachers and books on medicine to doctors and pharmacists. Returning to France was difficult for he had no wish to stay and wanted to leave again. During the two years he was in Africa, he had crossed the desert five to six times by car. The desire grew to cross it on foot. Later, after crossing so in 1984, when he made a presentation at his village he found that he had kindled curiosity but local runners didn’t want to make the trip alone. He therefore decided to organize a marathon in the Sahara. With the exception of one Moroccan runner, everyone else who participated in the first edition of the Marathon des Sables in 1986, were French. Over the years the event has grown to be one of the world’s toughest footraces with some legendary winners, among them the Moroccan brothers Lahcen and Mohamad Ahansal, the former winning the Marathon des Sables 10 times, the latter five times. Girish, who had no particular fascination for the desert and Sahara, was at the second edition of the Great Tibetan Marathon in Ladakh around 2006-2007. “ It was my first adventure marathon and a well organized one,’’ he said. At this event set in a high altitude cold desert, he met Brigid Wefelnberg, a German runner who had run the Marathon des Sables. She told him of the 250km-long race in the North African Sahara. Looking back, Girish said, “ I like extreme stuff. I am not a spiritual person, so it isn’t the life changing part of things that catches my fancy. Searching on Google for more on the Marathon des Sables, I found it billed as the toughest foot race on Earth. That attracted. Plus, based on my enquiries, no Indian national had completed it before.’’ From this onset of interest in the event to actual execution, it took Girish five years, including three years of training. 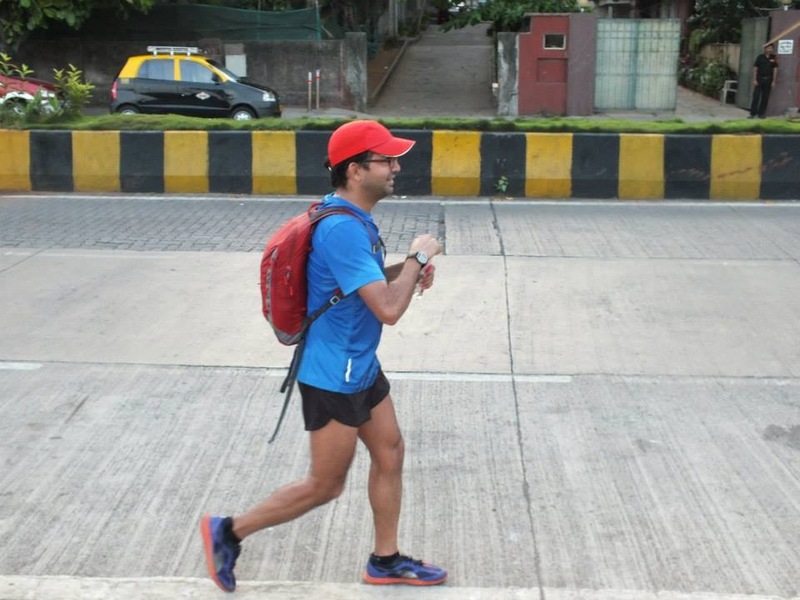 It was during this training phase that Girish acquired the image by which he came to be known in Mumbai – the runner who always ran with a backpack. He had to train so for the Marathon des Sables expects its participants to be self sufficient. A relative stranger to camping, he started familiarizing himself with sleeping on the floor in a sleeping bag. The ultra marathon in the Sahara has a night stage wherein runners cover 75-80km. To replicate this experience, Girish turned to randonneuring, which form of cycling had just taken off in India. He complemented this with running events like the Bangalore Ultra. Mumbai’s Juhu beach and Girgaum-Chowpatty doubled up as training ground for running on sand. It was, as Girish realized later, only a rough approximation of conditions because the sand of the Sahara is drier and finer. “ It is super fine,’’ he said. The beaches also became venue for running in gaiters, a sock like-appendage required to tackle the sand of the desert. Then for a taste of multi-day stage racing, he participated in and completed the first edition of the Kerala Ultra. It gave him a realistic perception of the potential relation between himself and multi-day stage races. “ I am a slow runner. I don’t like cut off times. Single day stage races have stringent cut off times. Multi-day races are more reasonable; they are better suited to my tastes,’’ he said. Incidentally, according to Girish, the winner of the first edition of the Kerala Ultra was Jordan’s Salameh Al Aqra, who would go on to win the 2012 Marathon des Sables. Girish’s own preparation for the Marathon des Sables continued. At the Kerala Ultra, which was a five day-stage race, in which the participants were provided only water, he tested the freeze dried food he planned to take to the Sahara. His go to-person for all matters Marathon des Sables was Brigid, who, prior to their meet-up in Ladakh was a three time finisher in the Sahara and is currently at six. One interesting thing in Girish’s preparations is that he didn’t try to run in a hot Indian desert as training for the Sahara. His logic was simple: there are many runners coming from cold countries to run in the Sahara. Compared to them, he would be reaching the venue in Morocco after preparing in India, a warm country. 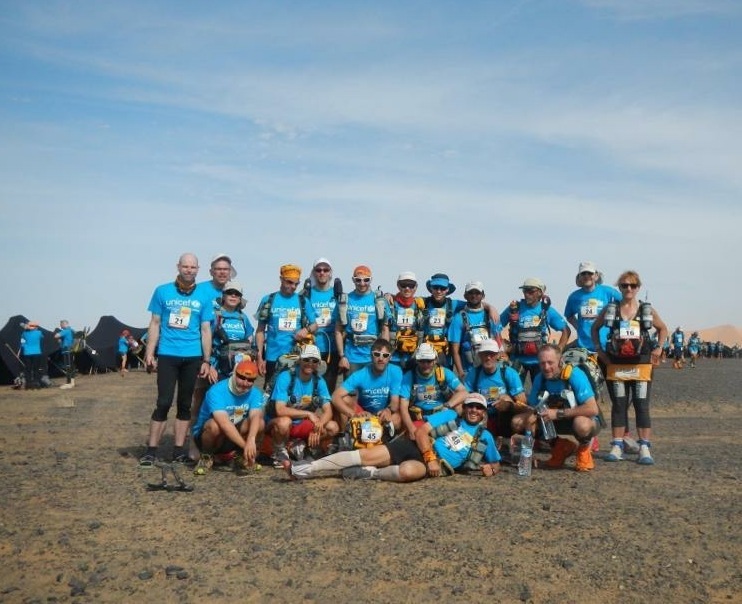 Participation in the Marathon des Sables is routed through regional representatives. An Indian runner’s application would normally go through the Korean representative. Courtesy Brigid, Girish’s papers moved via Germany. In April 2013, he flew to Frankfurt and then with the German contingent of runners, proceeded to the Moroccan Sahara. From the last airport, it was a 350km-bus journey to the starting point of the race. Here the organizers provided tent and food; the runners acclimatized for two days. Interestingly, nobody knew the race route till they got onto the bus. On the bus, the runners got the route details. The whole camp at start was an amalgam of around 1000 runners and 1500 support staff. This would keep migrating across the desert for the days of the race, along its assigned route. Ahead lay six and half days of running in the Sahara. Girish’s backpack weighed around 10 kilos plus 1-2 litres of water. According to him, the eventual race winners, wizened by previous experience had trimmed their backpack weight to around six kilos or so. 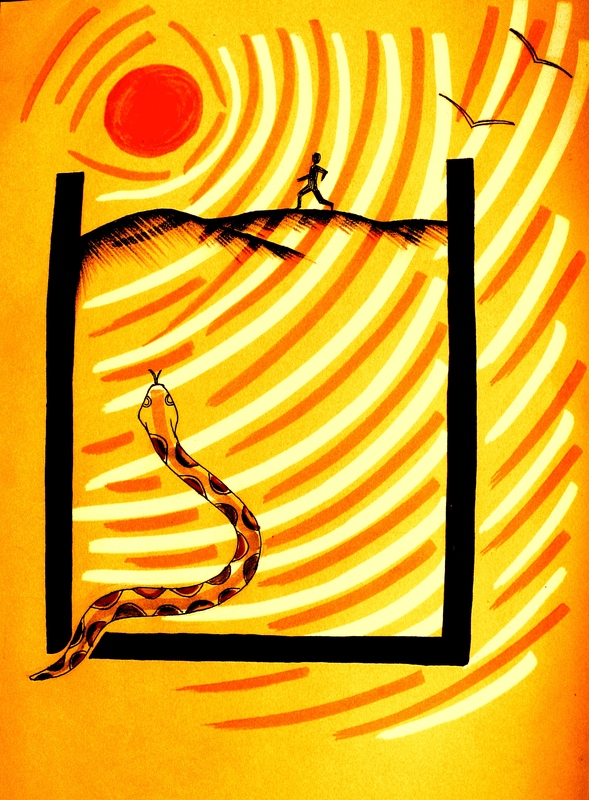 The nature of the Marathon des Sables is evident in two items Girish had to mandatorily source – a reliable compass for navigation and an antivenin kit to address snake bites. Things can go wrong in adventure. Ten years before the first SCMM in Mumbai, in 1994, the Marathon des Sables was backdrop for the story of Mauro Prosperi. A former Olympic pentathlete from Italy, he was lost for ten days in the desert following an eight hour-long sandstorm. When the storm hit, he had just half a bottle of water with him. Mauro would eventually walk off course by over 290km into the Algerian Sahara. He took shelter for a couple of days in a small, unoccupied Muslim shrine. There, he attempted suicide by slashing his wrists. It failed because his blood clotted, likely due to dehydration. Mauro took that as a sign. He resumed his walk heeding the advice the Taureg (nomadic inhabitants of the Sahara) had given ahead of the race: if you are lost, head for the clouds that you see on the horizon at dawn, for that’s where you will find life. During the day, it will disappear. So set your compass and proceed in that direction. Miraculously, Mauro survived the entire ordeal drinking his urine (not recommended as urine dehydrates) and bat blood, and eating bats, snakes and lizards. Notwithstanding such risk, most runners find the Sahara beautiful. Even Mauro did. In his account, available on the BBC website, Mauro says, “ when I arrived in Morocco I discovered a beautiful thing – the desert. I was bewitched.’’ The Italian returned to run the race again in 1998 and 2012. He completed it in 2012, the year Salameh Al Aqra won the Marathon des Sables; the year the Jordanian runner ran the Kerala Ultra, in which Girish had been one of the participants running it as preparation for the 2013 Marathon des Sables. The race edition Girish was on went off incident free. There were no sand storms. While temperatures in the Sahara during the race can range between 50 degrees centigrade and seven degrees, Girish had to cope with a manageable 37-38 degrees and 14-12 degrees. Progress was a mix of running and walking. According to him, the night stage was exhausting. After the fourth and fifth stages got over, he had a sense of potential finish. “ You are hungry most of the time. You are thirsty. Yet you keep going,’’ he said. According to him, each day a runner at the event burnt on the average 5000 calories against an intake from the supplies he carried, of approximately 2000-2200 calories. That meant an accumulated deficit over the race’s six days of almost 18,000 calories. 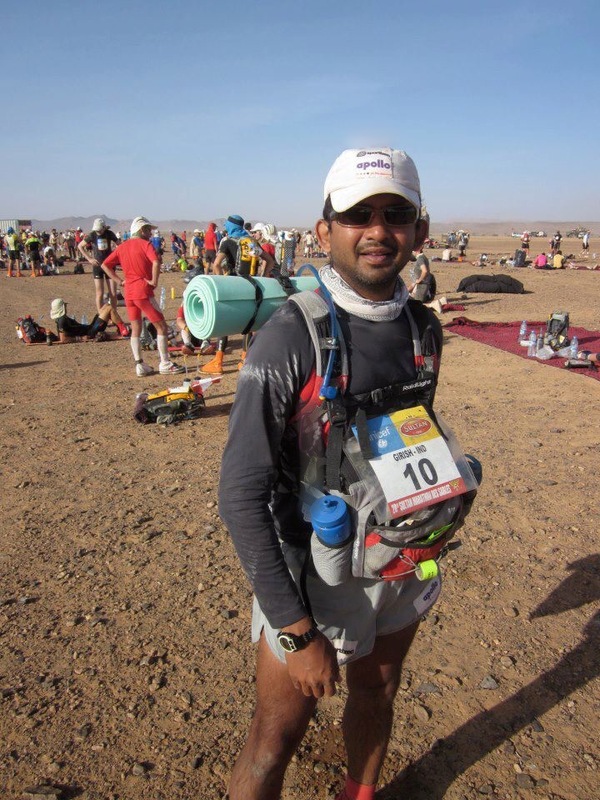 Girish completed the Marathon des Sables in the stipulated six and a half days. Across the Kerala Ultra and the Marathon des Sables, Girish suffered no blisters at the former and just one at the latter. After a long run, he also recovers fast. “ I think I was made for multi stage races,’’ he said. Europeans repeat running the Marathon des Sables several times as they find it life altering. 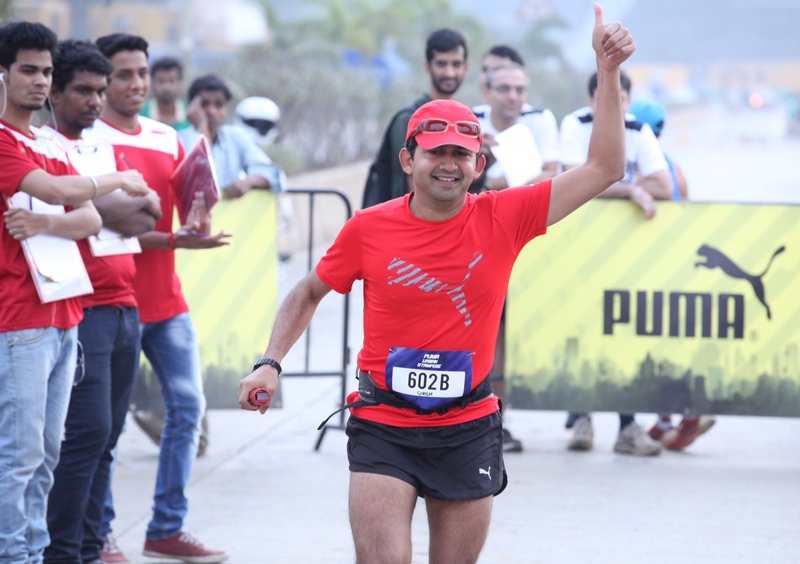 Girish has no such plans; at best perhaps, “ one more time.’’ For someone who trained three years and waited five years overall with the Marathon des Sables in focus, Girish had a puzzling self assessment to offer. “ I don’t like discipline at all. I like to enjoy what I am doing,’’ he said. Similarly, despite his apparent clarity in terms of what his strengths are and what his preferred type of stage races are, in 2014, Girish participated in the Langkawi Ironman. Triathlons are single day multi stage events with pretty strict cut off times, the abject opposite of his growing faith in multi-day stage races as personal forte. He suspects that it may have been a Timex Ironman Triathlon watch, which he got in the tenth standard that injected the longstanding desire to try the event. “ That watch may have put Ironman in the head,’’ he said. His hopes were also boosted by participating in a triathlon in India, which incidentally had a more relaxed stage cut-off time than the overseas Ironman. The Langkawi experiment ended a Did Not Finish (DNF). 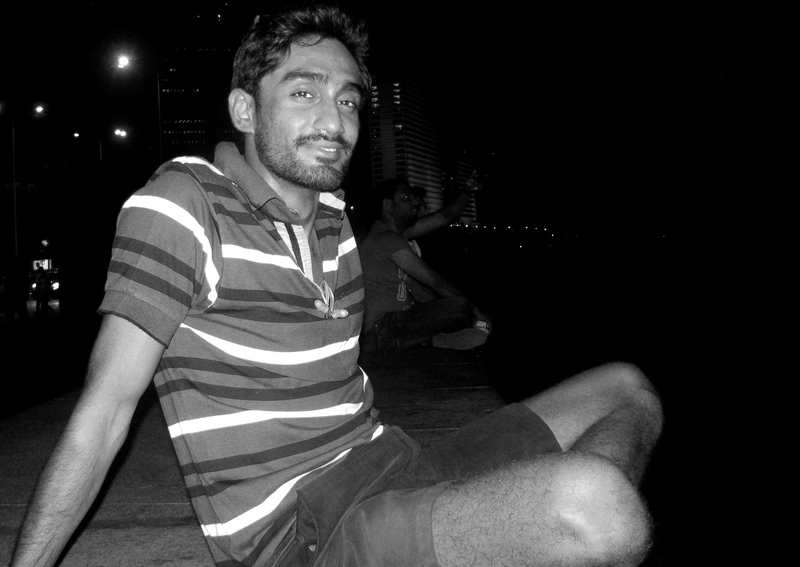 A committed runner who is additionally well versed in marketing, Girish has sponsors. Won’t DNF hurt sponsorship? 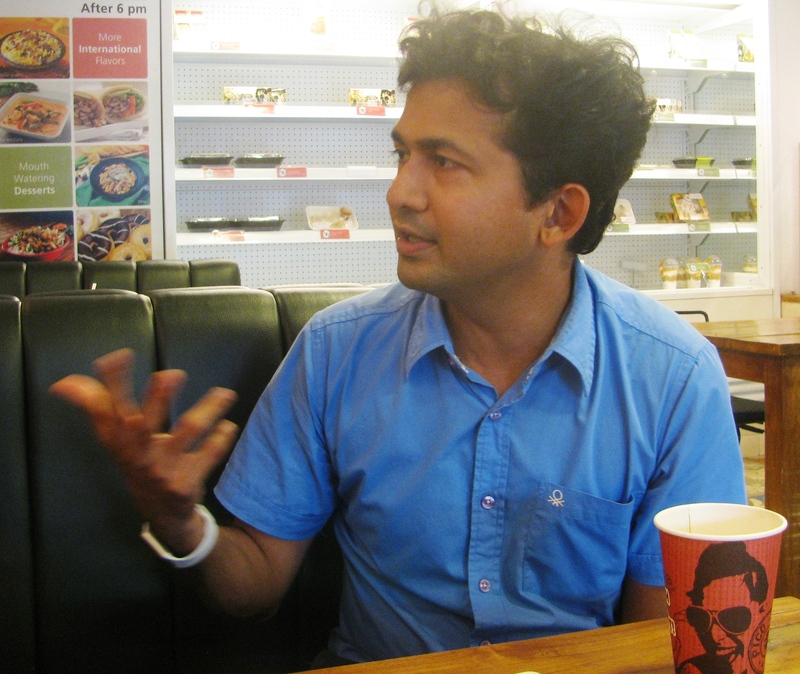 “ Being honest and upfront about failure is the best way to handle that,’’ Girish said. Hours after we met him for a chat, Girish left for Athens to run the 2015 Athens Marathon followed by the marathon in Istanbul. In early January he will run the marathon in Los Angeles before keeping his appointment with the 2016 SCMM. Future projects also include the Marathon du Medoc in Bordeaux, France, a sort of gourmet’s delight with over 20 wine stops and a variety of foods available along the race route.